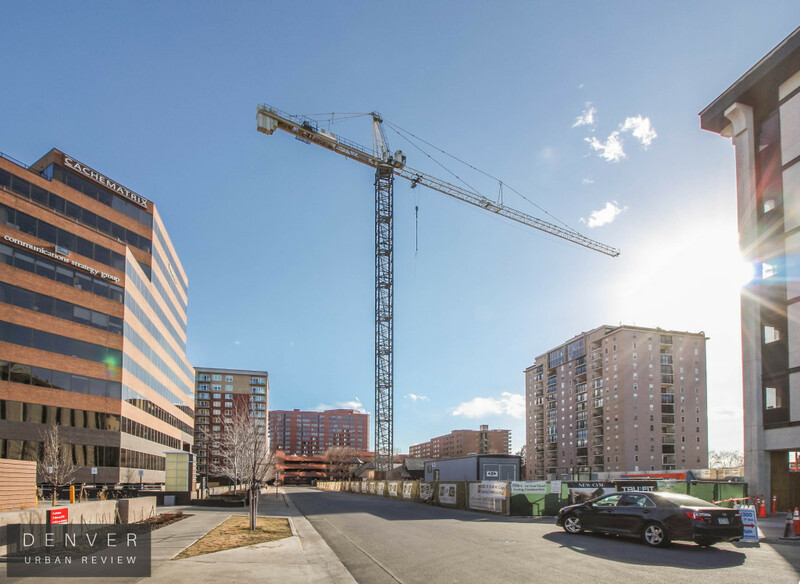 Residential developer Greystar is planning to construct a residential project in Denver's Golden Triangle at Speer Boulevard and Bannock. 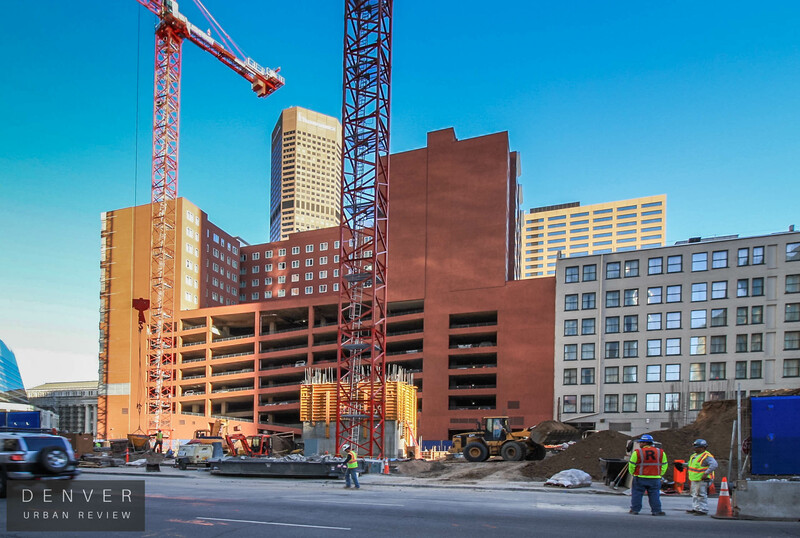 Greystar provided Denver Urban Review with the above rendering, but at this time has not released additional details. 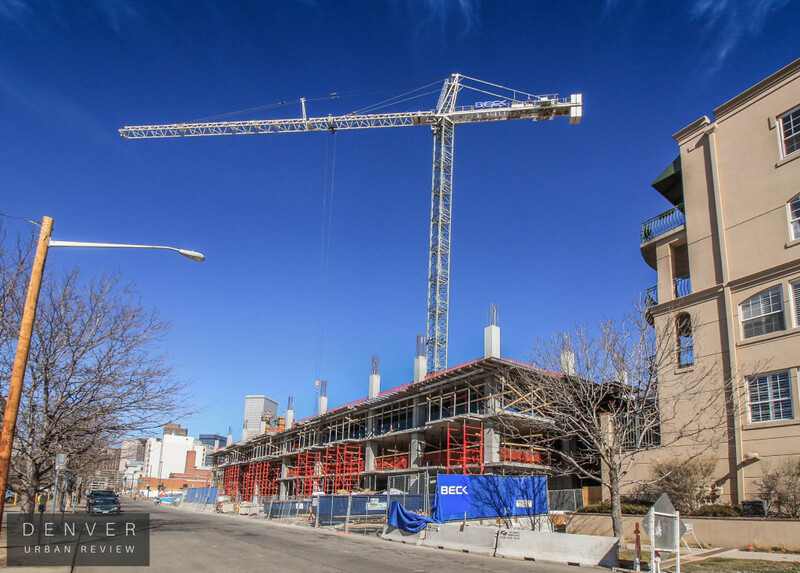 Speer & Bannock is not the first large apartment project in this part of Denver. 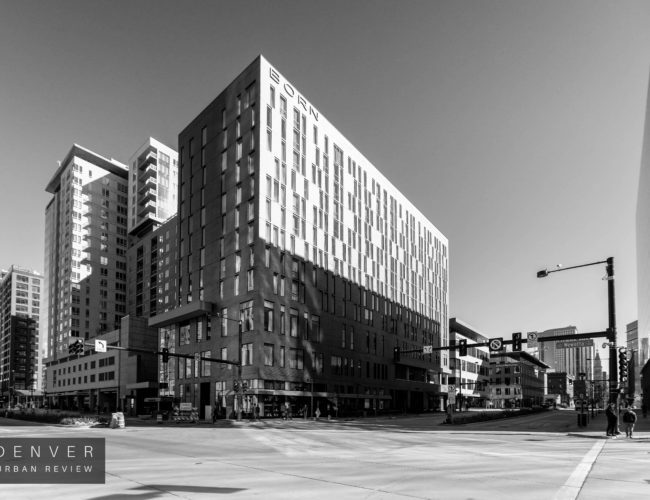 The Golden Triangle is home to the recently completed Joule apartment project at Speer Boulevard and Cherokee. 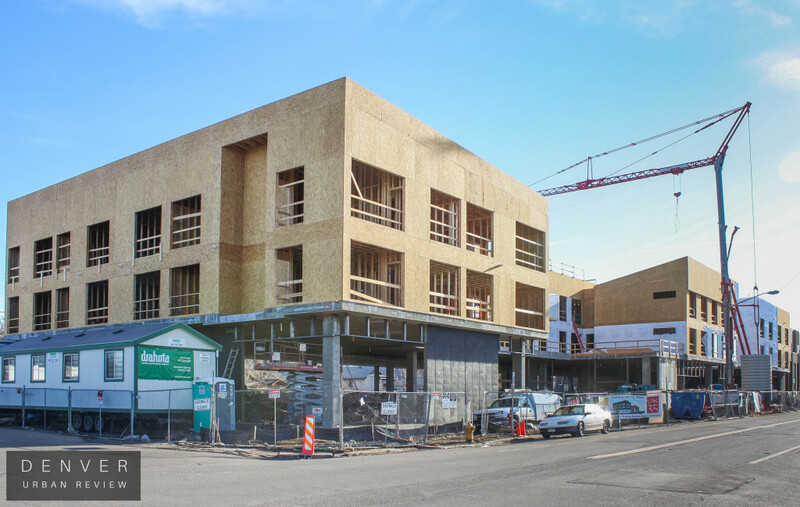 The under construction Eviva apartment project at 13th and Cherokee is also taking shape. 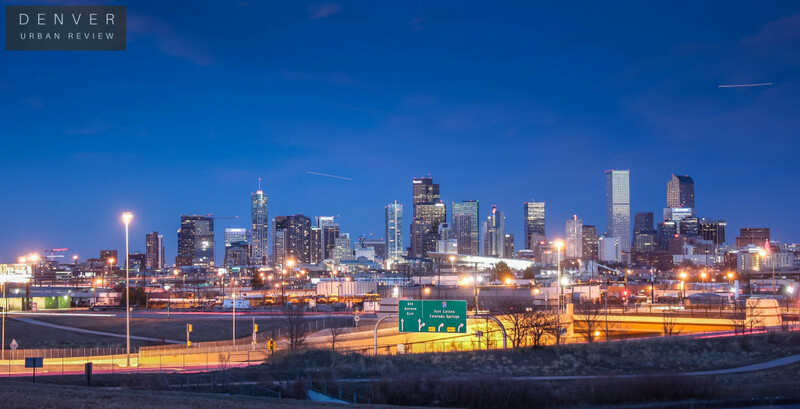 Balfour Senior Living and Northstar Commercial Partners have announced plans to jointly develop a 63,000 square-foot community on a 1.5 acre site located at 2979 Uinta Street in the Stapleton neighborhood of Denver. 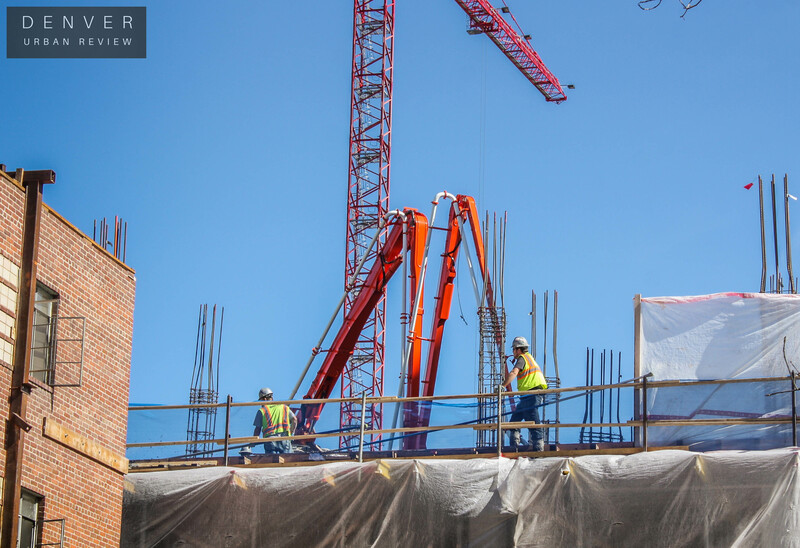 The project will be made up of 58 assisted living apartments, including a secure memory care component. 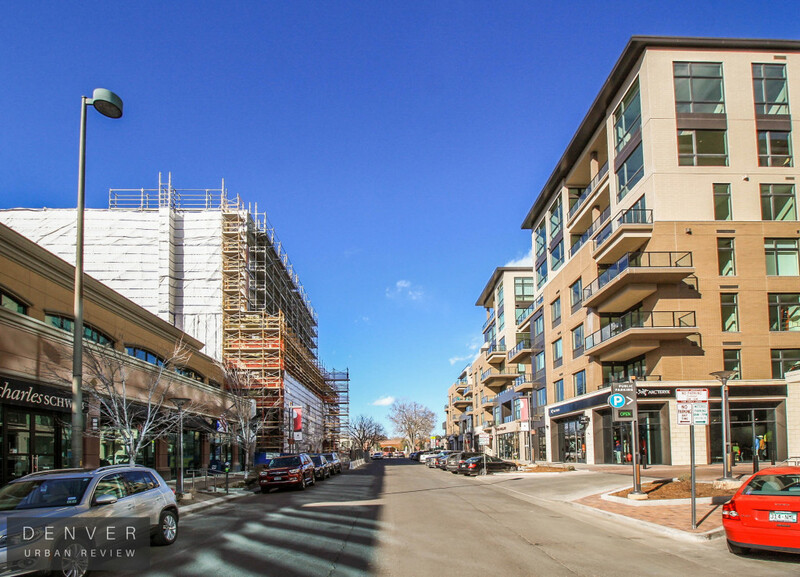 “Balfour is committed to building and operating the best senior living communities in Colorado. This new project will incorporate all we have learned from our nearly 20 years of developing and operating senior housing, and we are excited to bring a Balfour community to this important Denver neighborhood,” said Balfour Senior Living Founder and Chief Executive Officer, Michael K. Schonbrun. 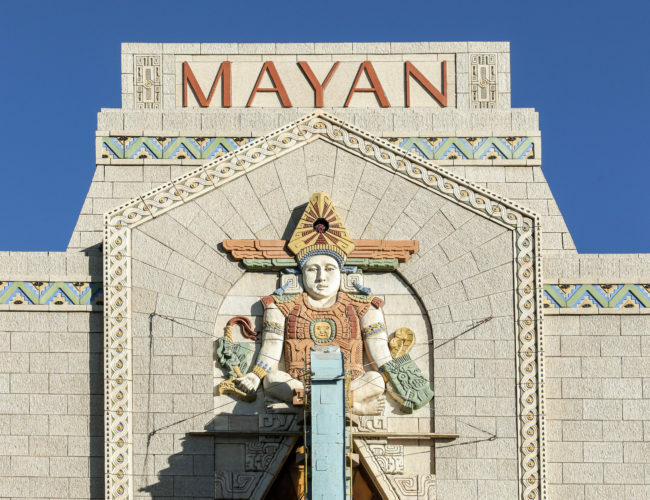 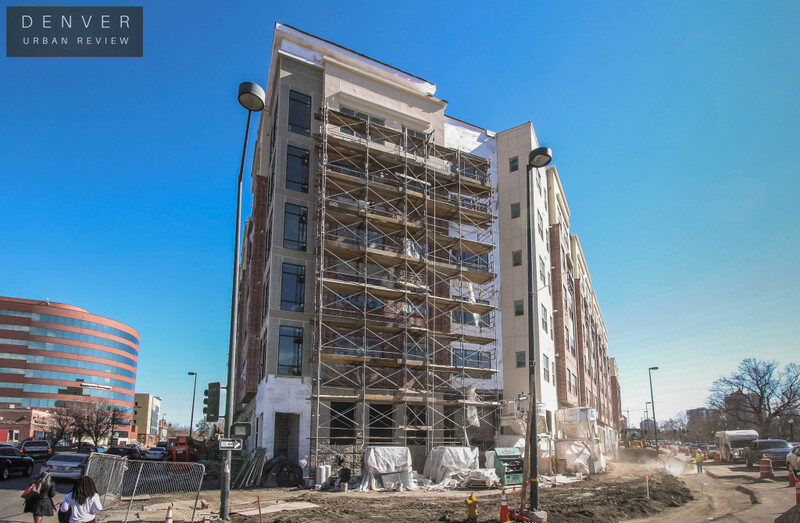 Davis Wince, Ltd., is the architectural firm that is designing this development, and Brinkmann Constructors will serve as the general contractor for the project. 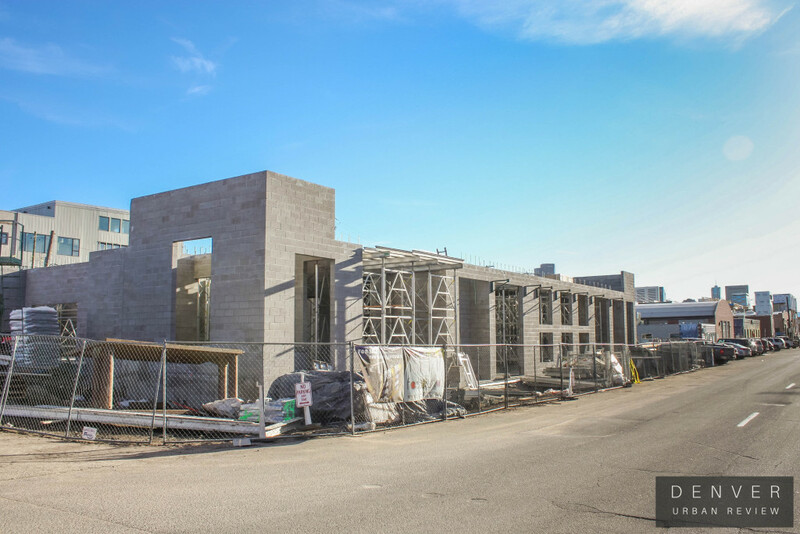 Amenities will include a salon, chauffeured transportation, a fitness center and common areas for educational and event programming. 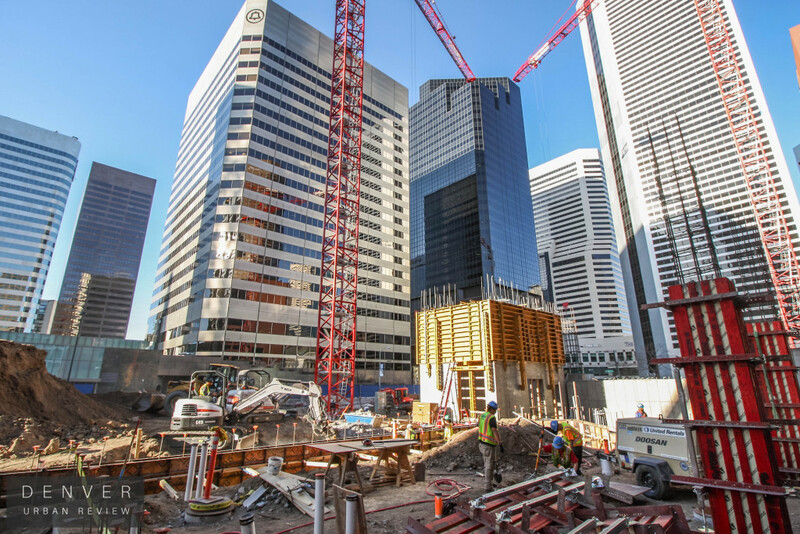 The project is slated to be completed in the first half of 2017. A Balfour Senior Living development was completed adjacent to Denver's Riverfront park in February of 2015 at 15th Street and Little Raven. 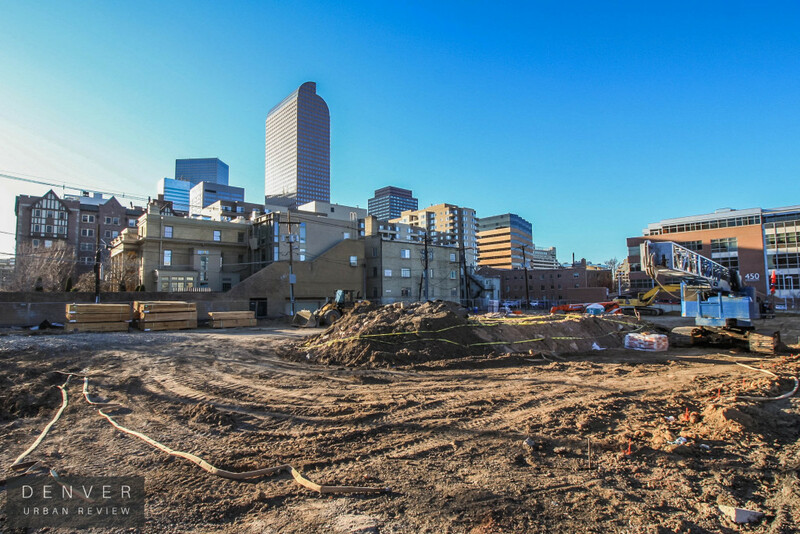 To see Denver Urban Review's inside look at that property click here. 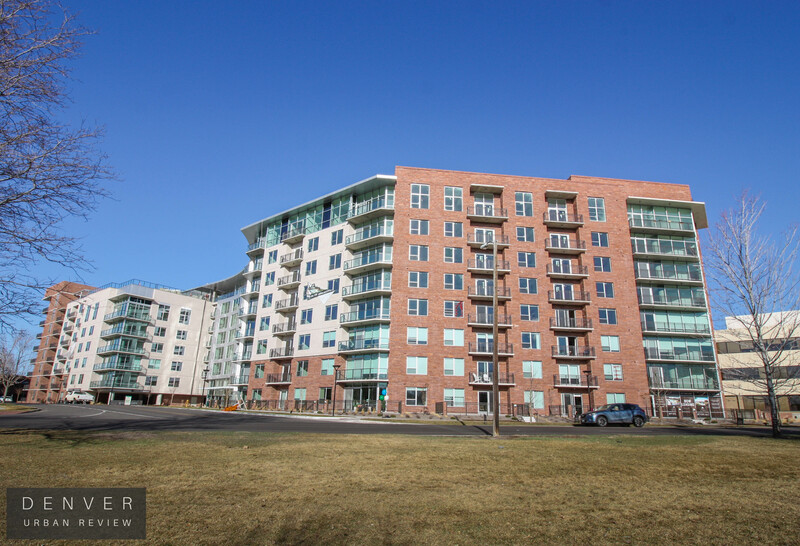 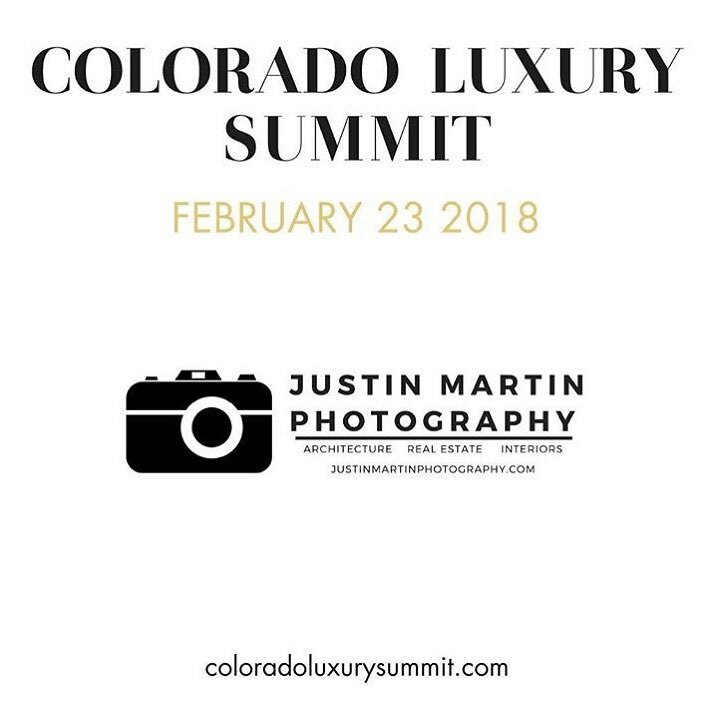 Balfour currently operates five properties all of which are located in Colorado. 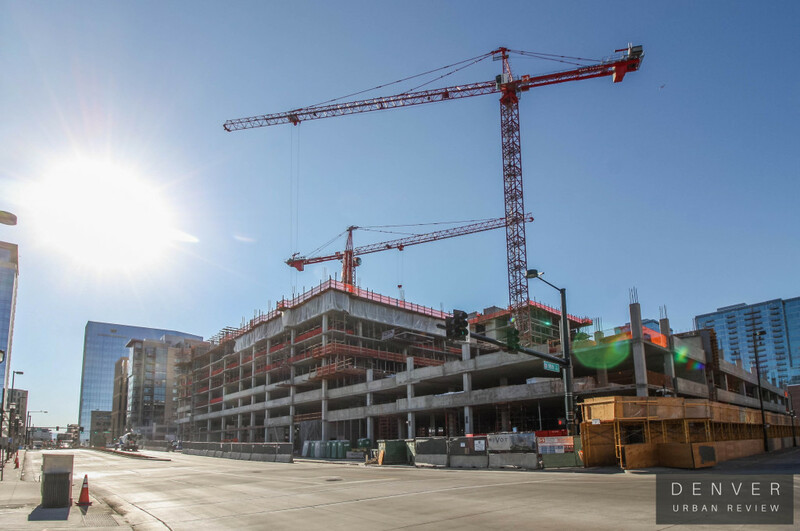 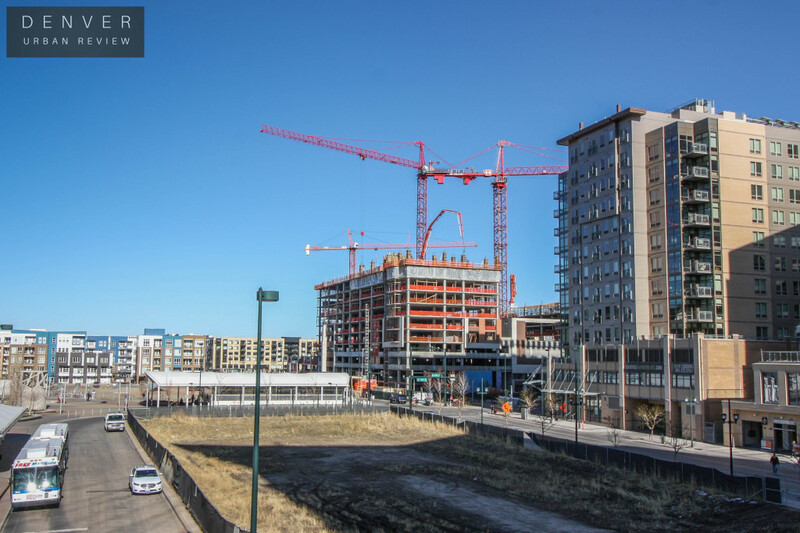 Here is a look at the progress of the construction projects taking shape in Denver's Cherry Creek neighborhood. 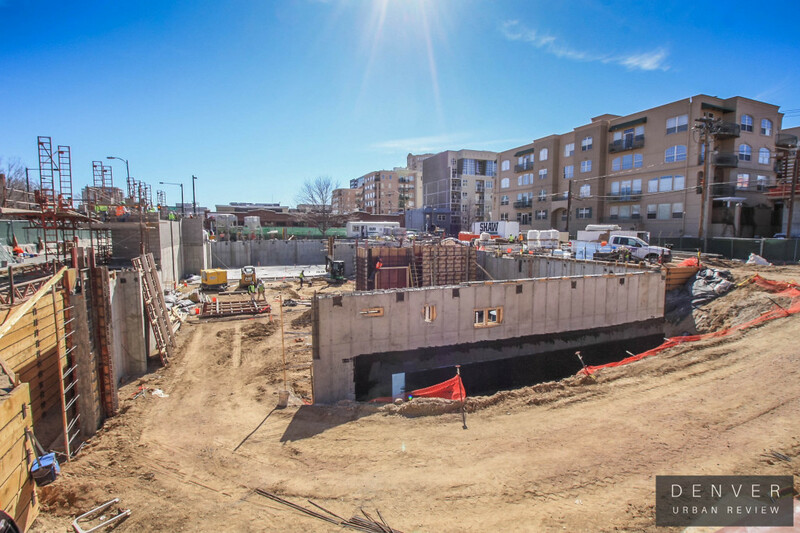 During the last Cherry Creek construction update, the finishing touches were being applied to the 250 Columbine condo project. 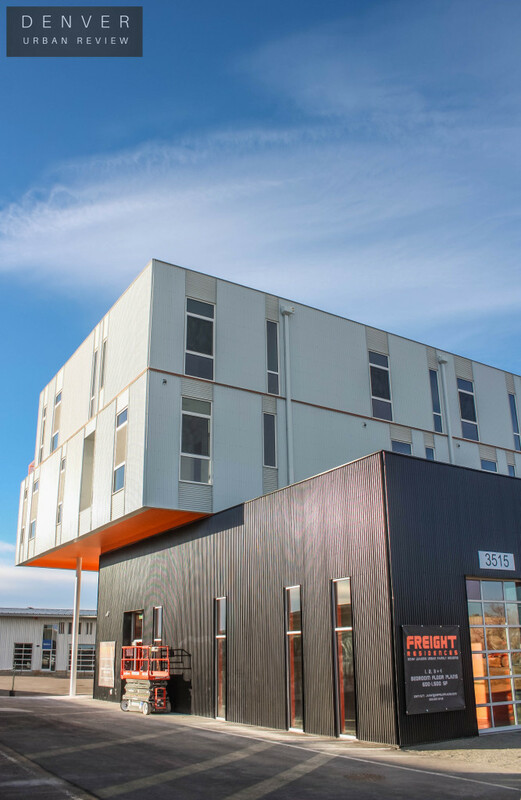 Here are a couple of photos of the finished building. 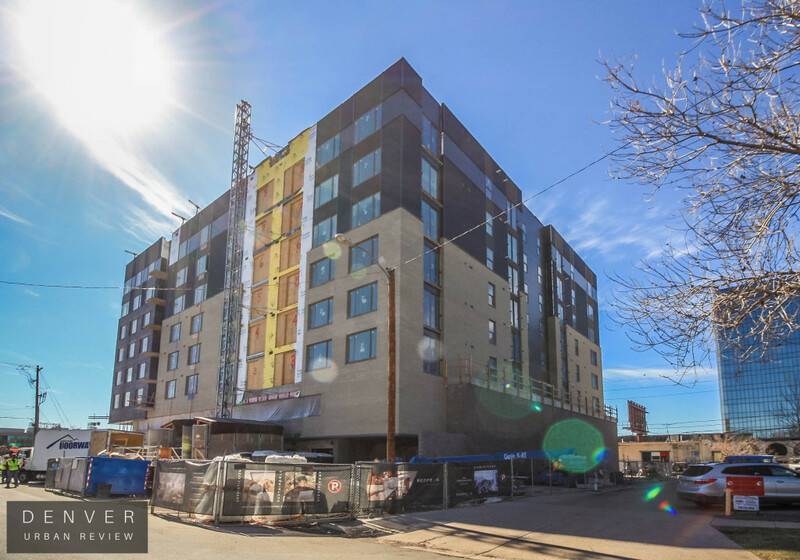 On the other side of Columbine Street is a 155-room hotel project that is being developed by Sage Hospitality. 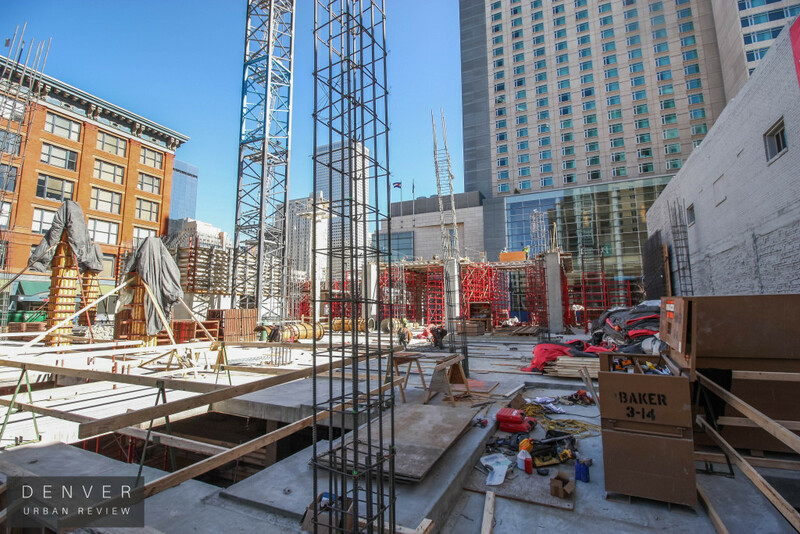 The hotel will have room for two ground-floor restaurants. 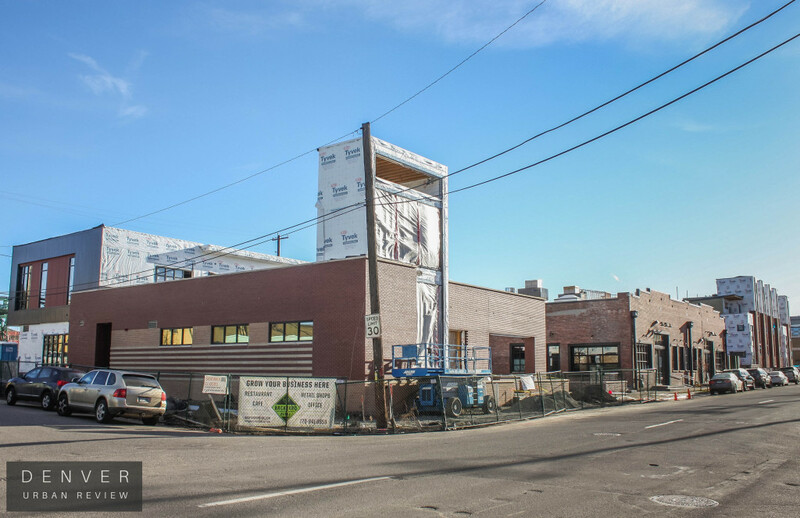 This structure is taking shape at 245 Columbine which was once the location of a post office. 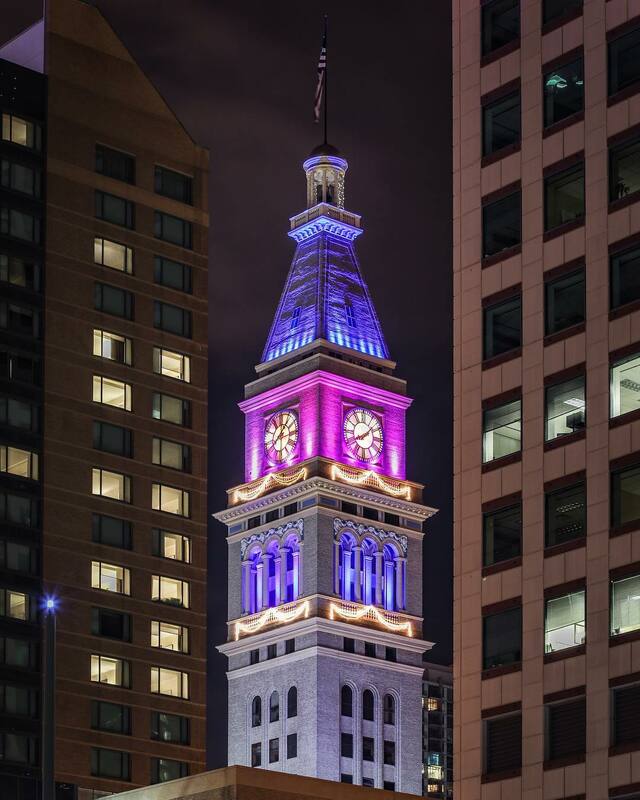 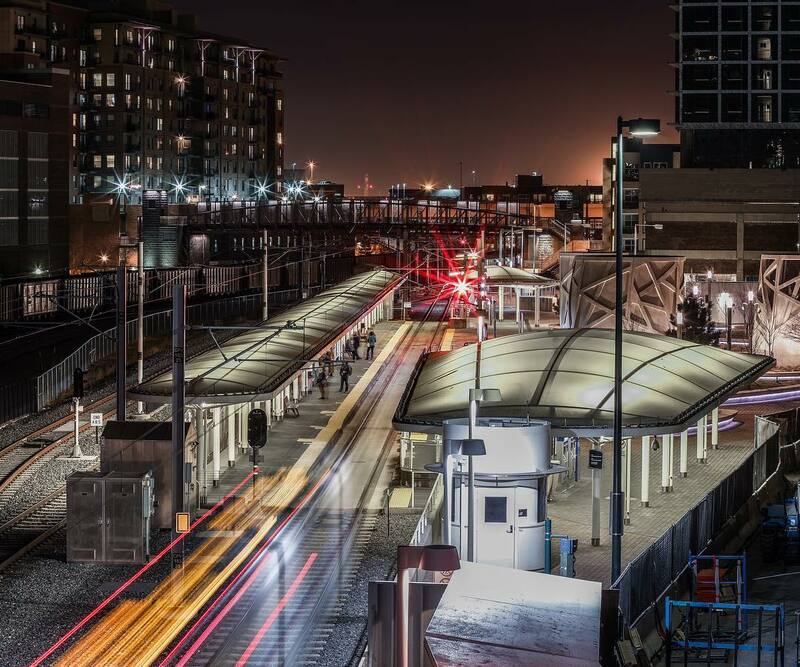 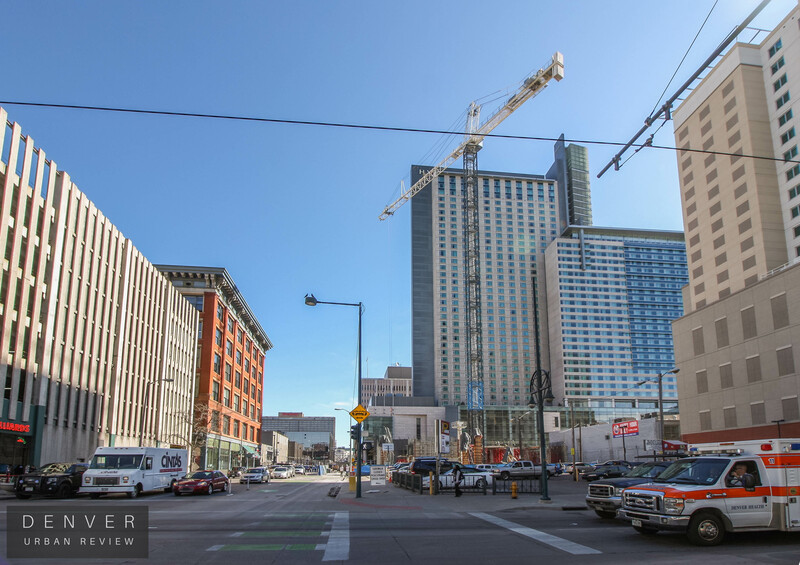 Sage Hospitality also operates the Crawford Hotel at Denver Union Station. 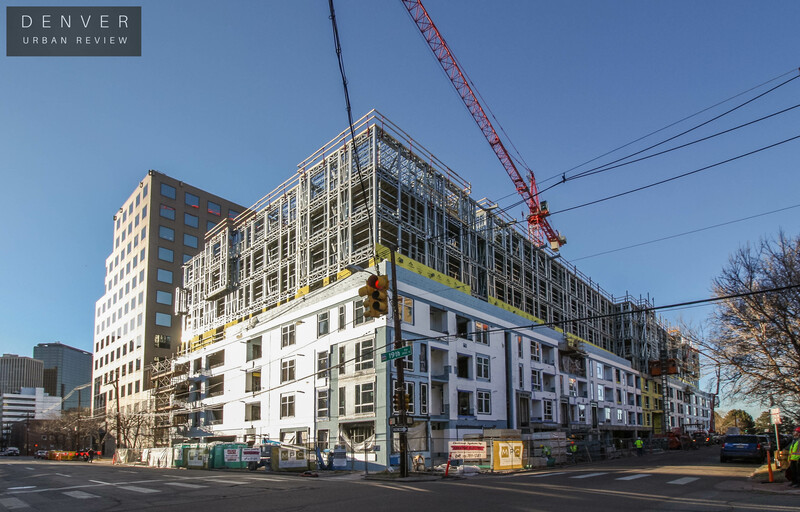 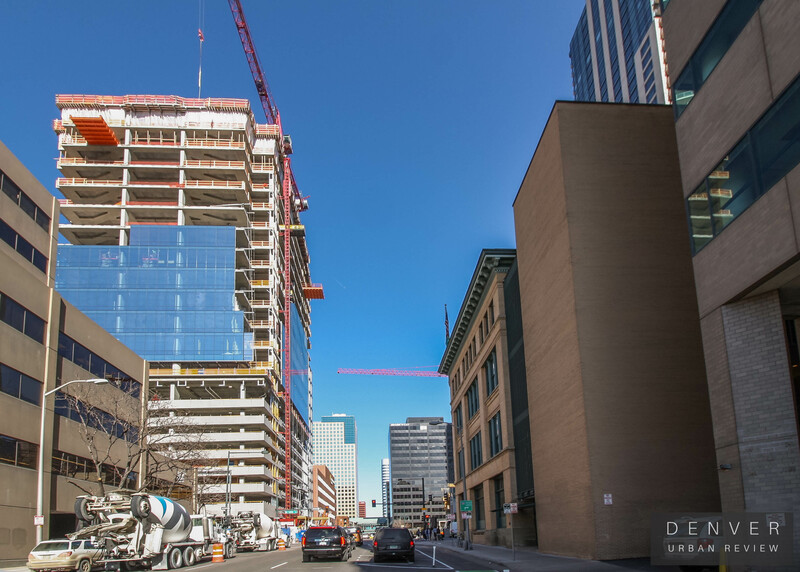 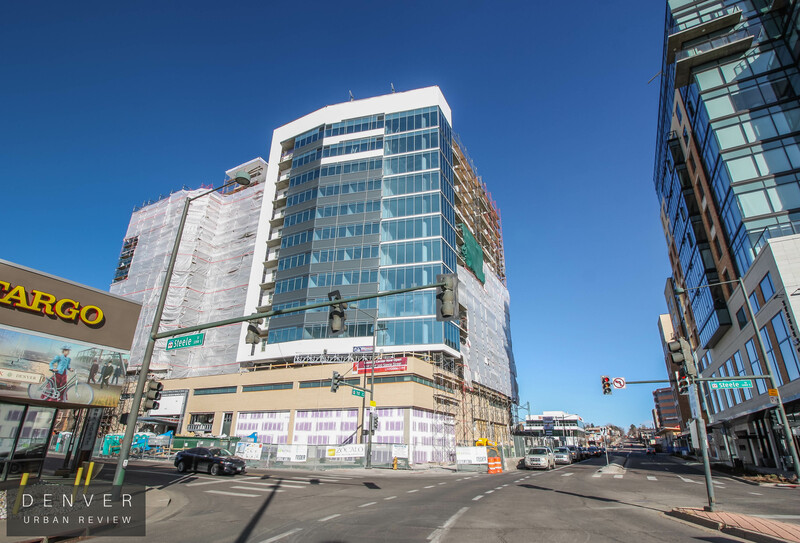 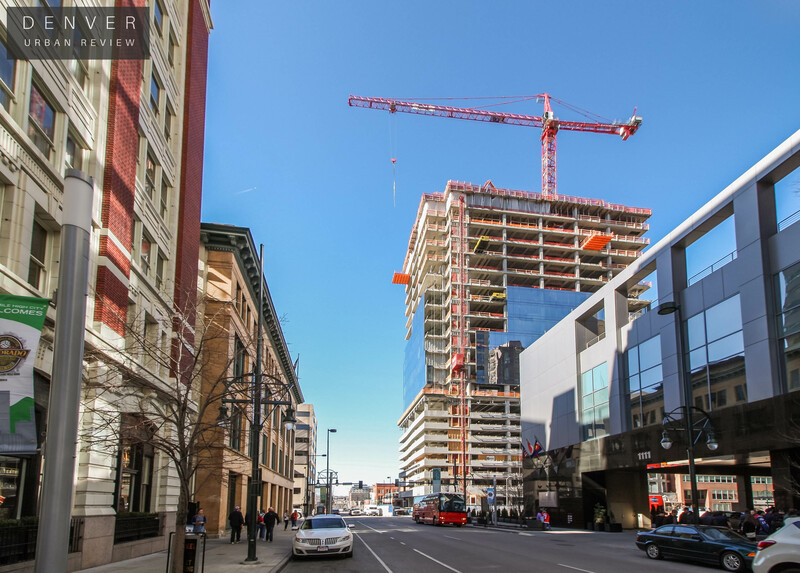 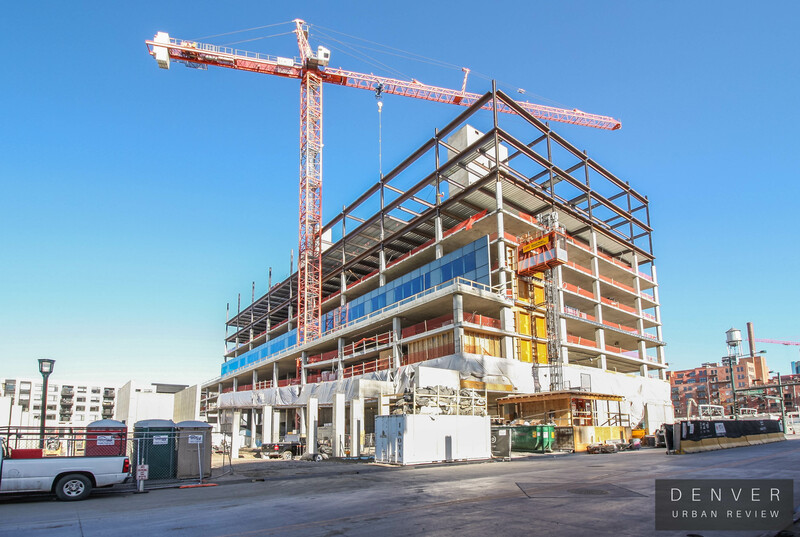 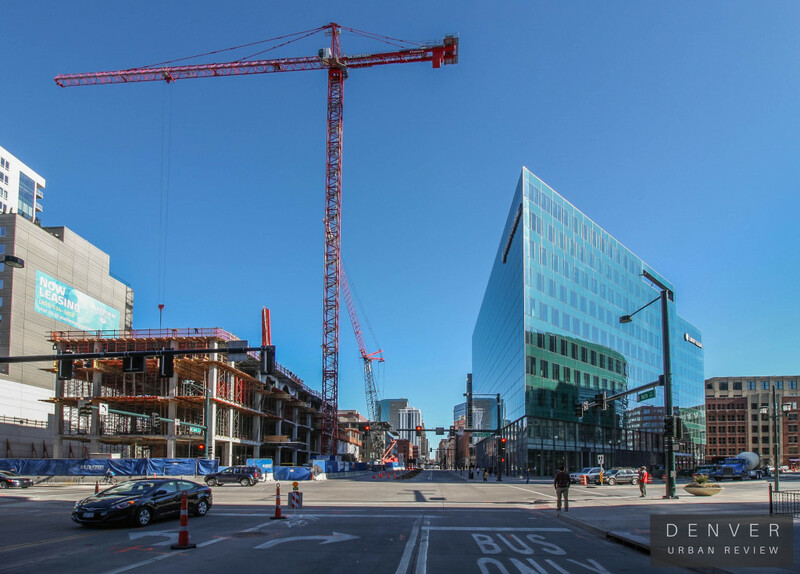 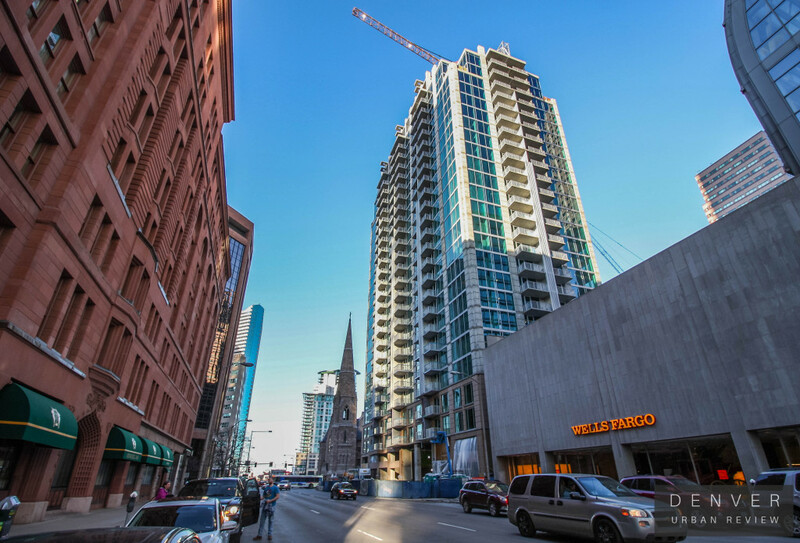 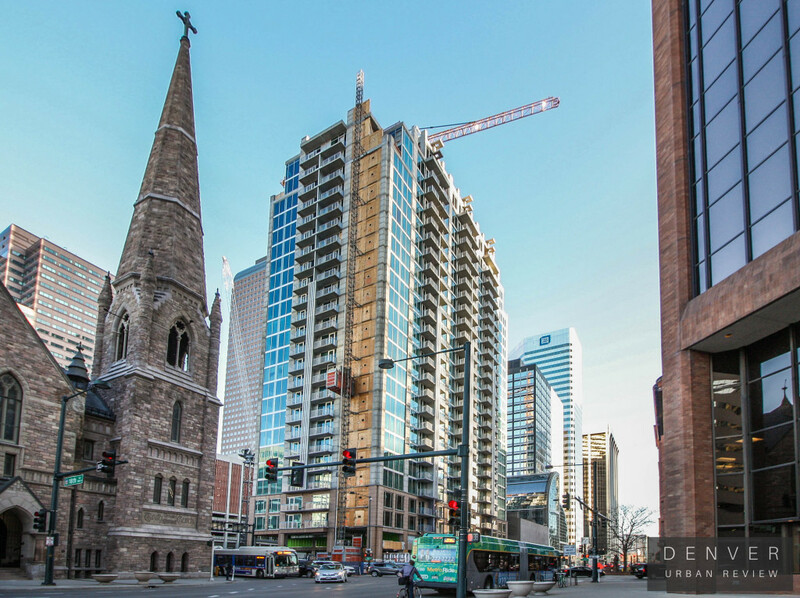 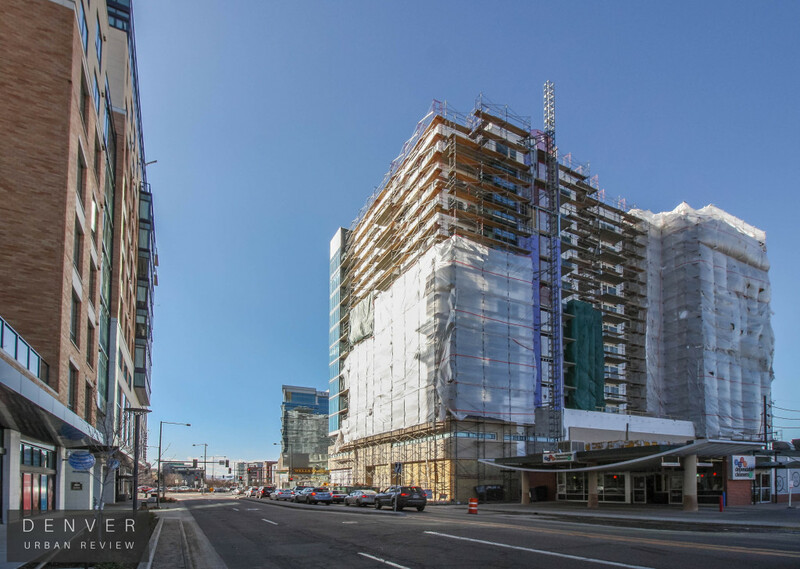 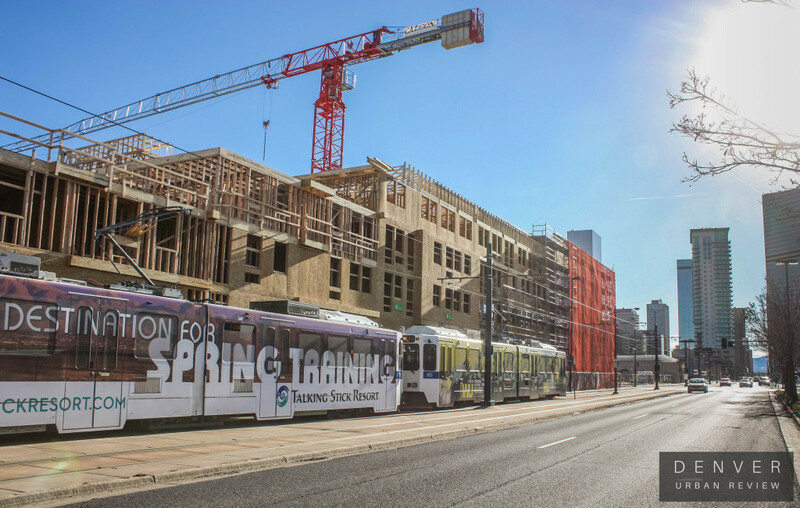 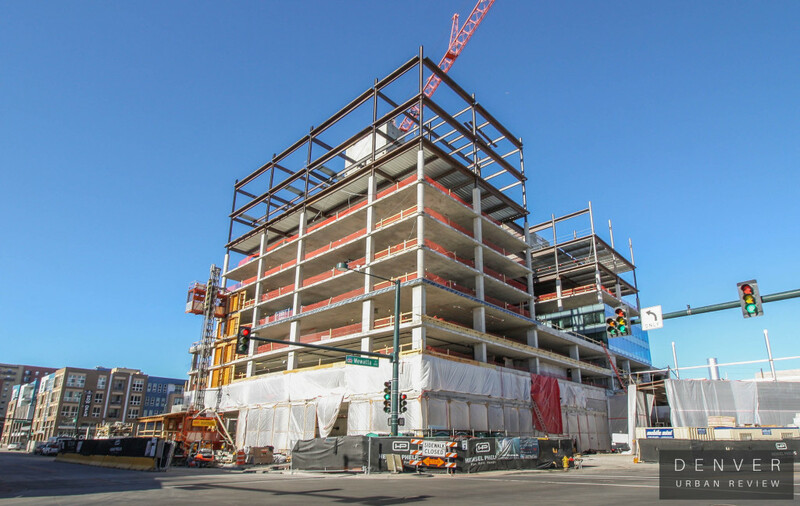 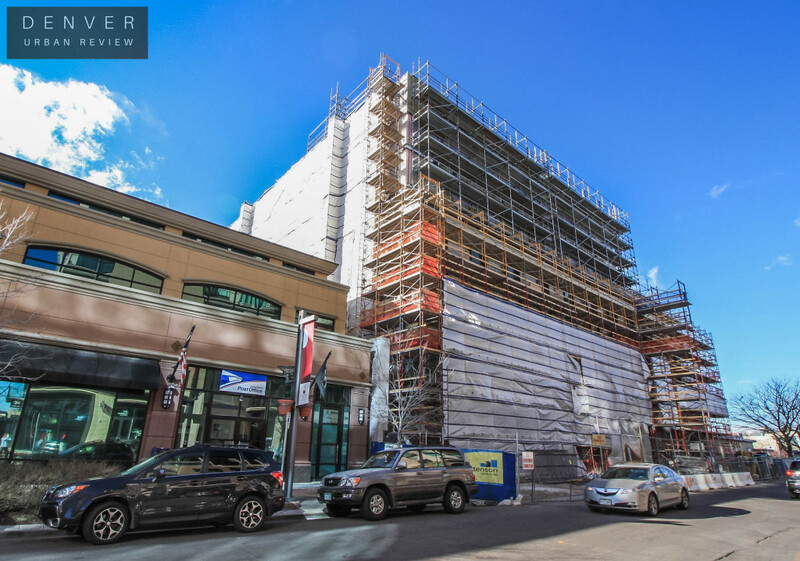 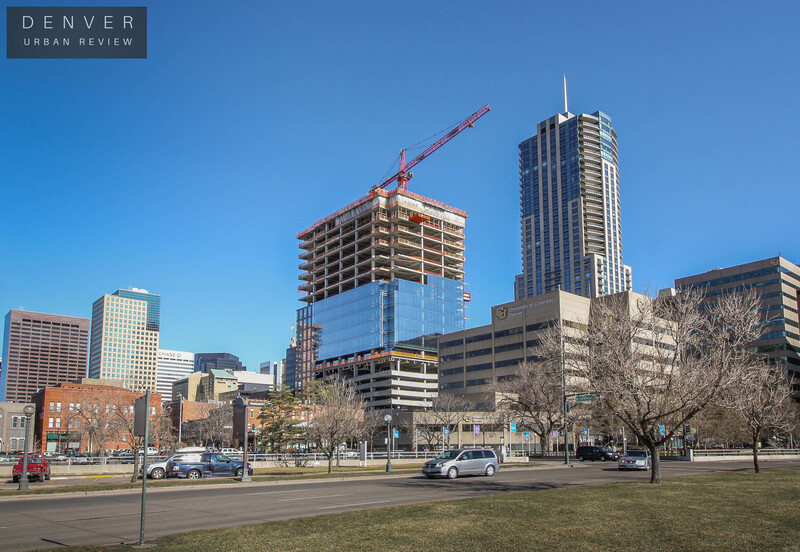 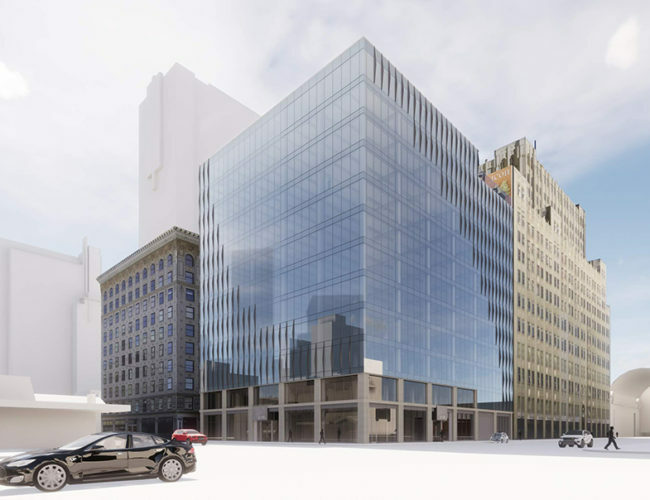 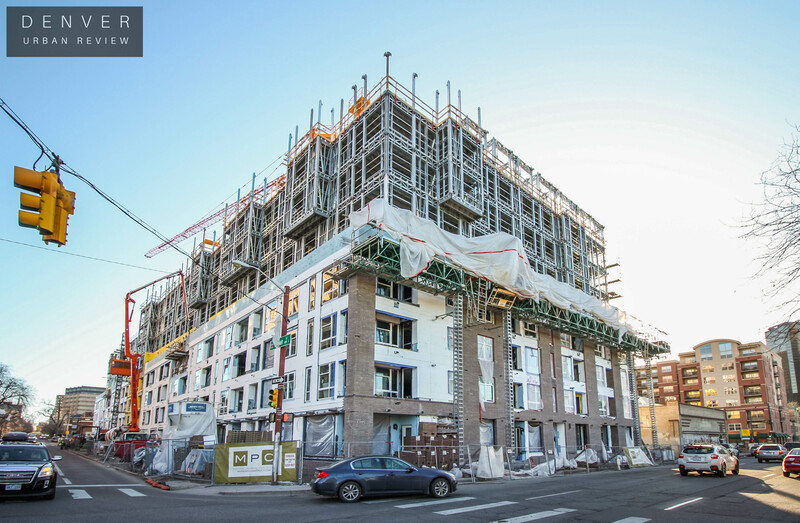 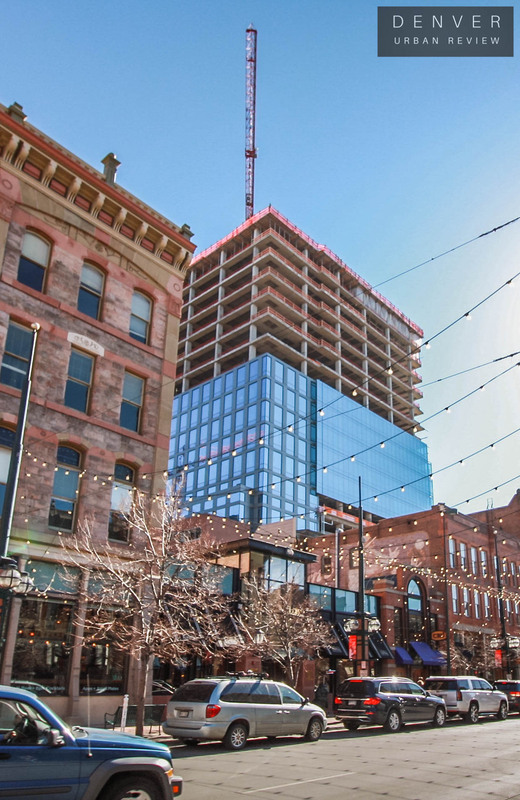 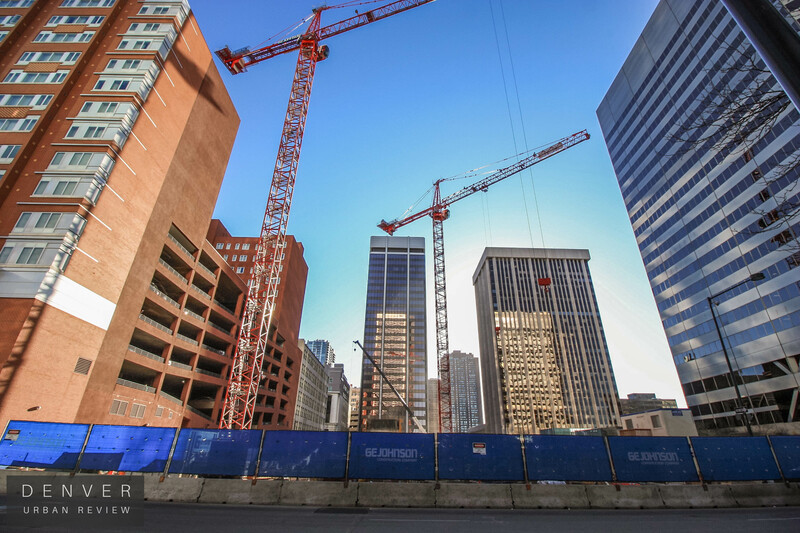 Sage will also operate the hotel that be located in the Dairy Block project that is currently under construction in the LoDo neighborhood of Denver. The Hotel at 245 Columbine has been named Halcyon. 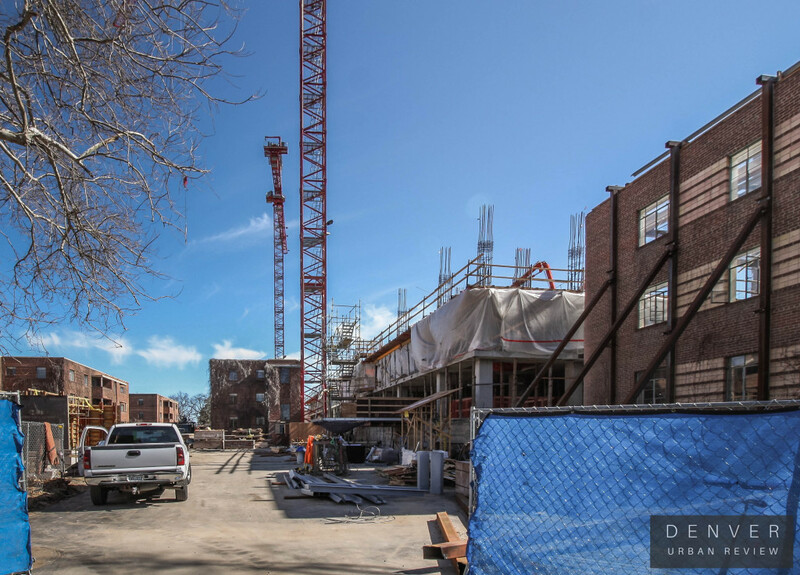 The below photo depicts Halcyon on the left and 250 Columbine on the right. 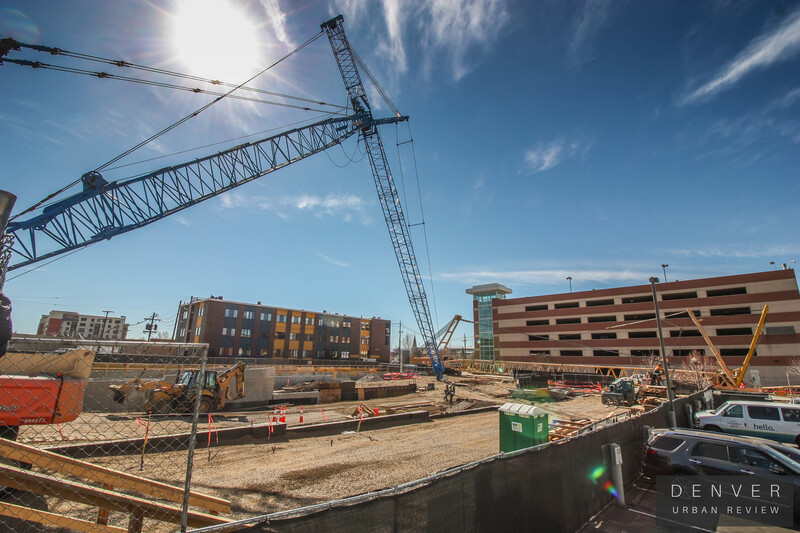 The Halcyon construction site as viewed from the public parking garage on 2nd Avenue. 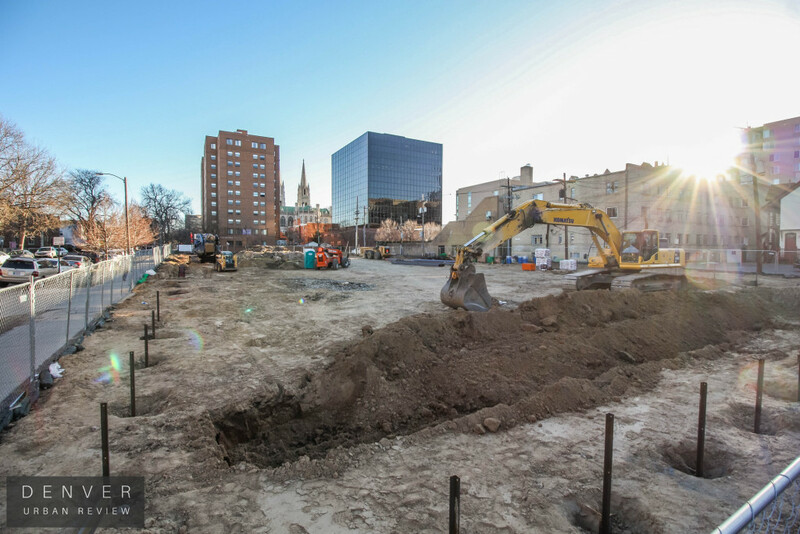 Below is a photo of the Room & Board retail store that is under construction at 2nd Avenue and Detroit Street. 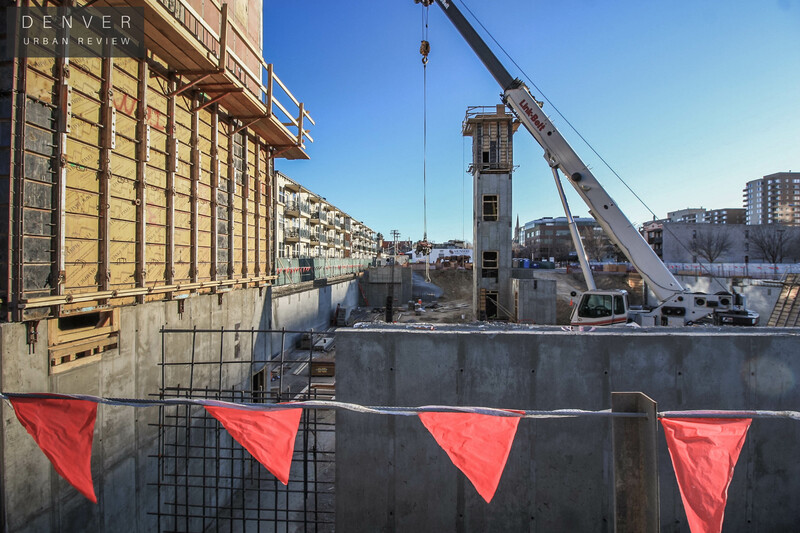 When looking through the window, one can see that interior work continues to take place. 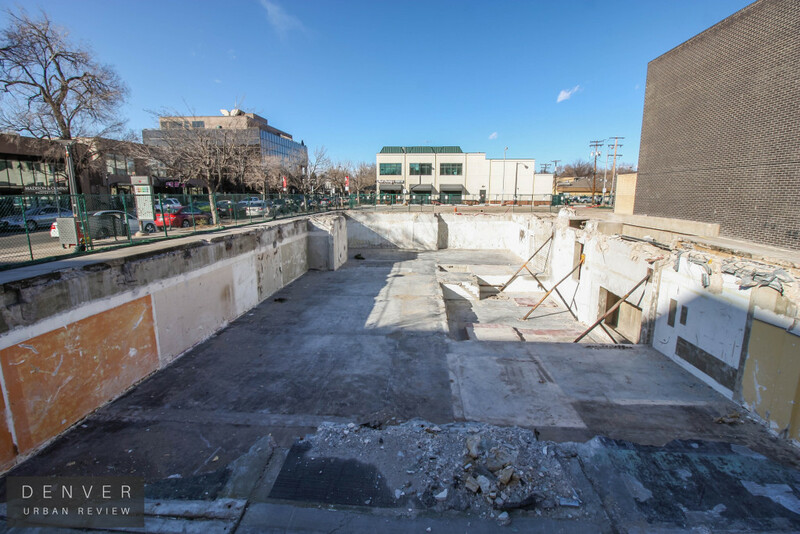 At 2nd and Milwaukee an existing structure has been demolished to make room for the construction of a future 200-room hotel. 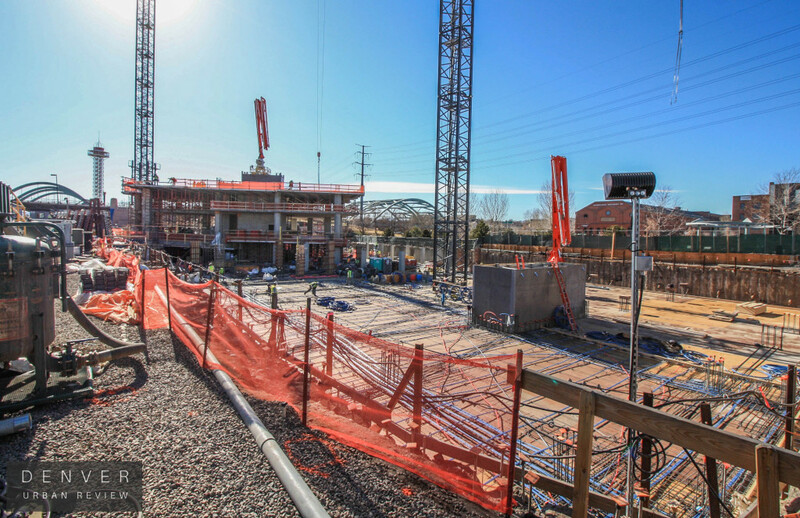 Here is a picture of the site. On the northeast side of Steele Street and 1st Avenue, we see the Coda apartment development. 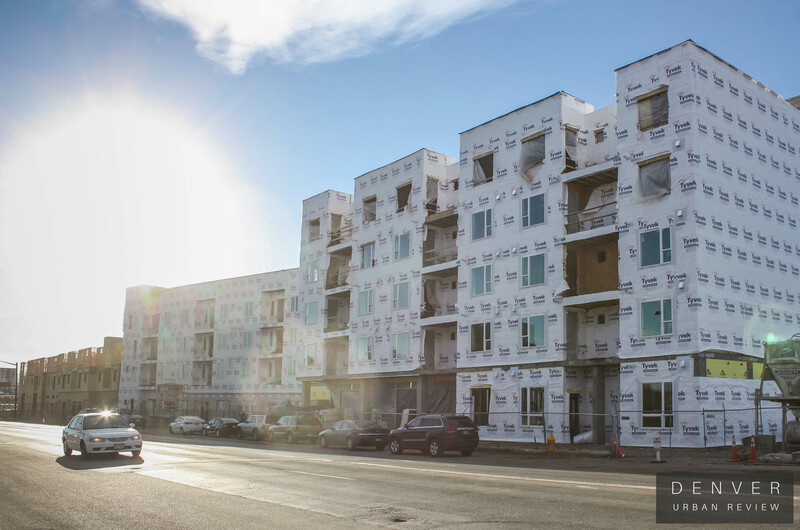 This project topped off in October. 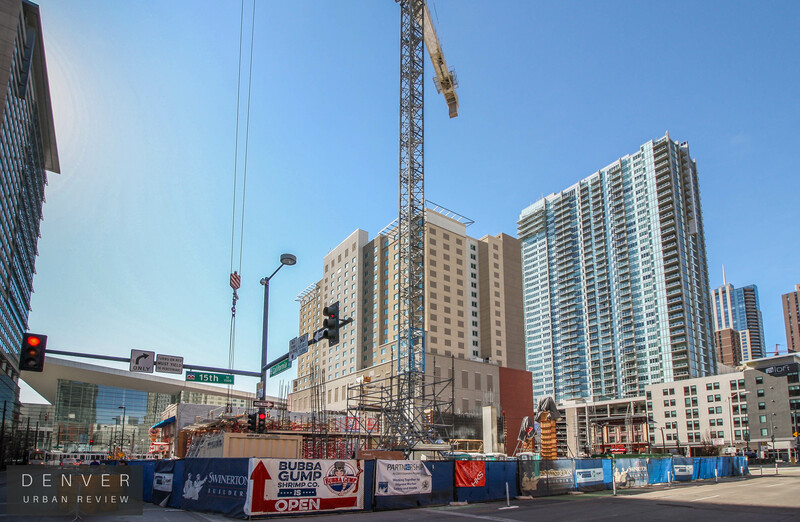 The project will include 182 apartment units in this 12-story building. 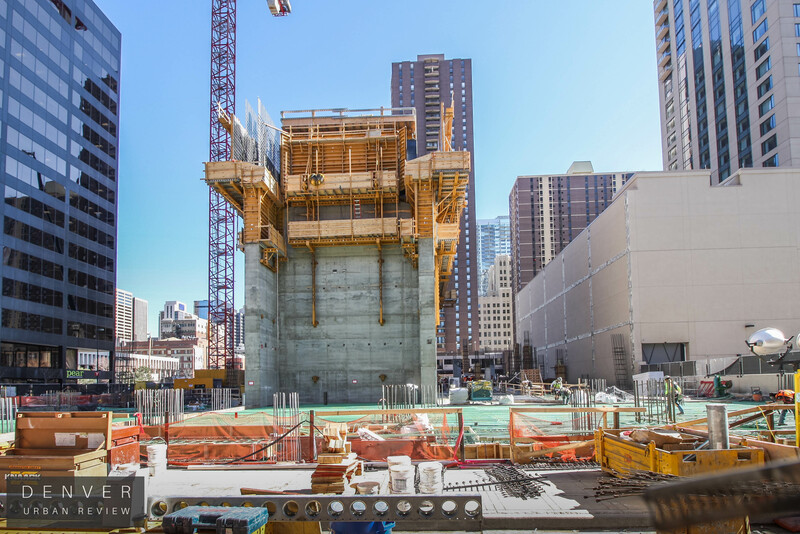 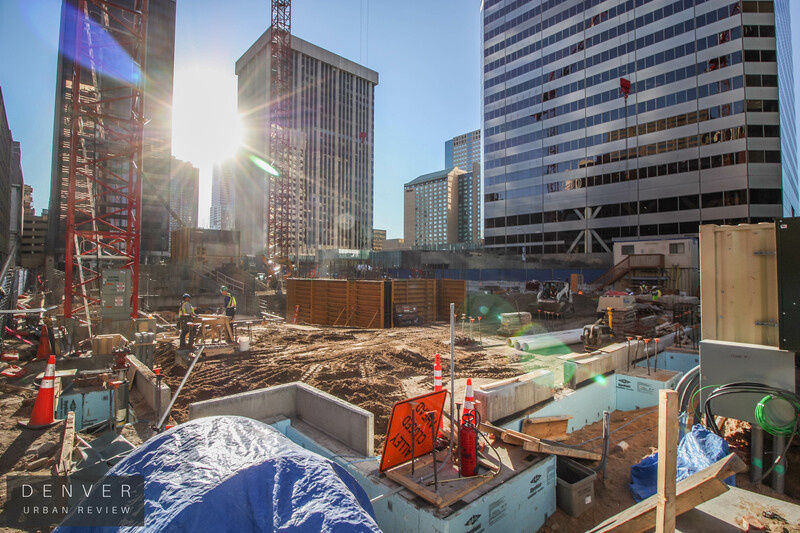 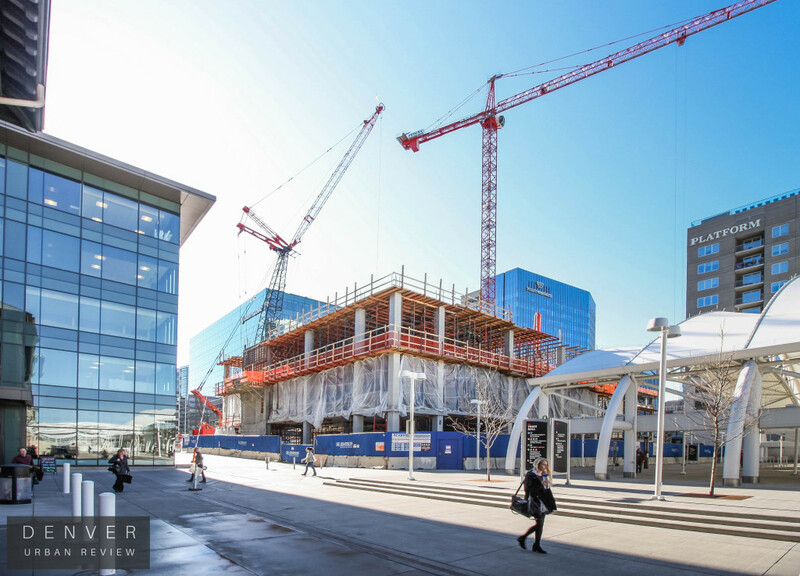 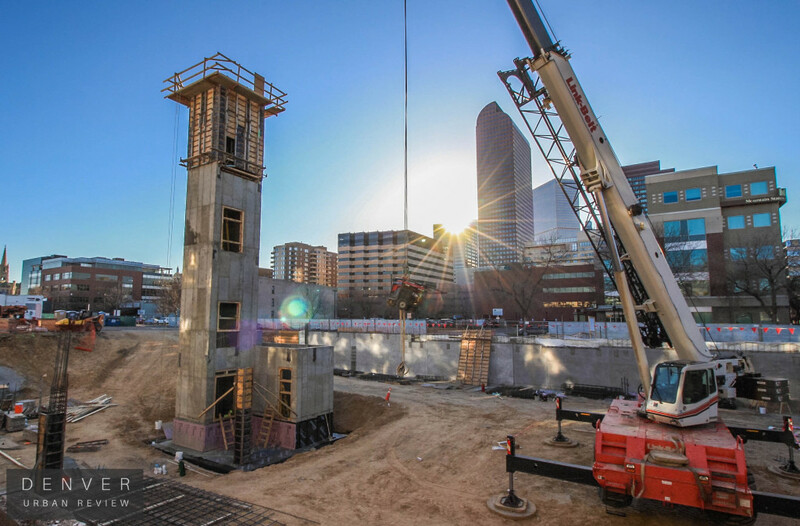 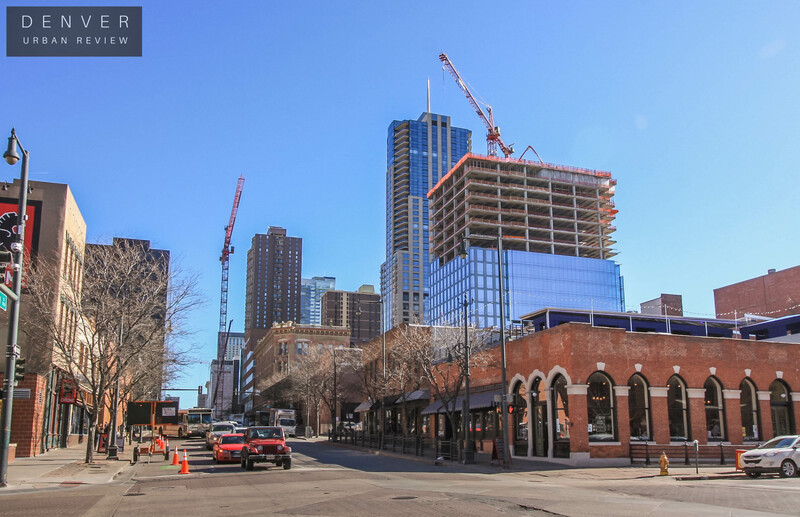 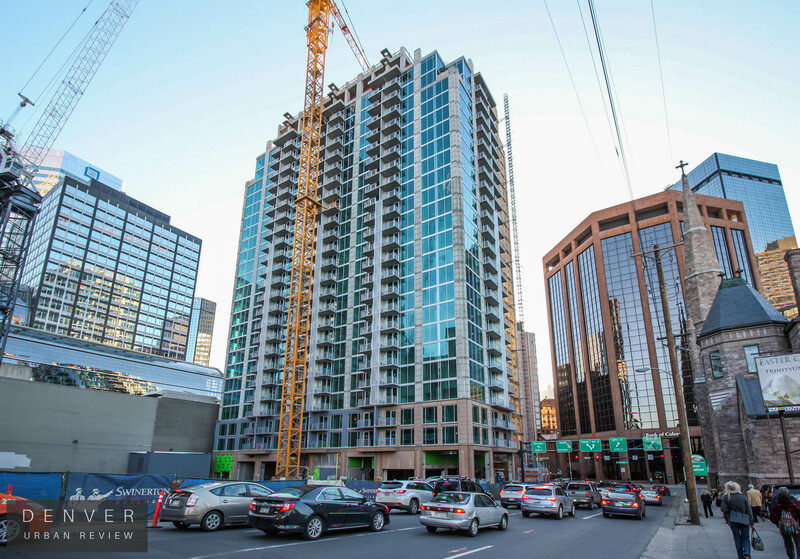 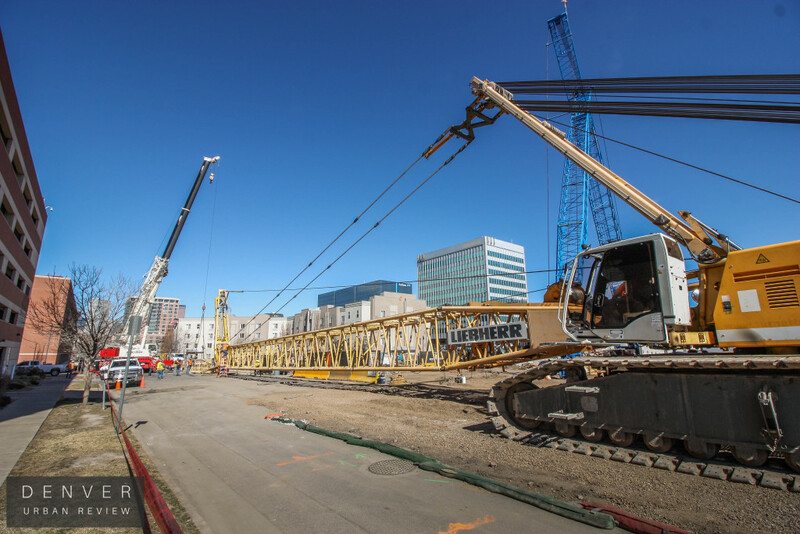 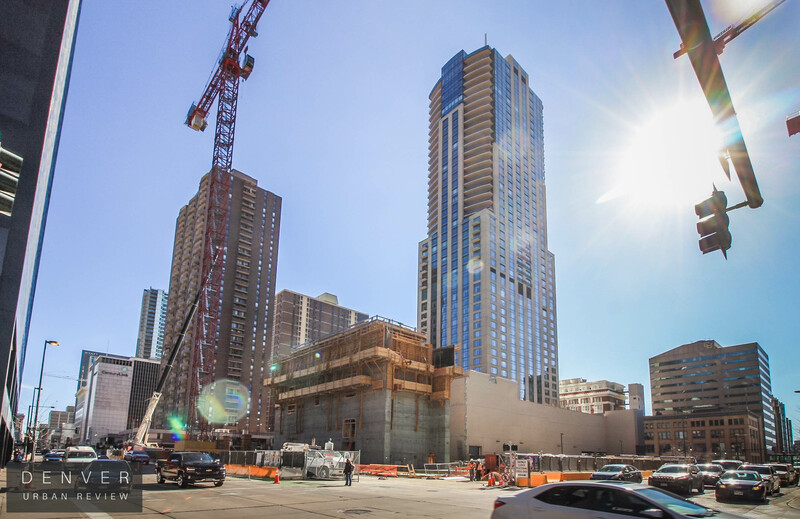 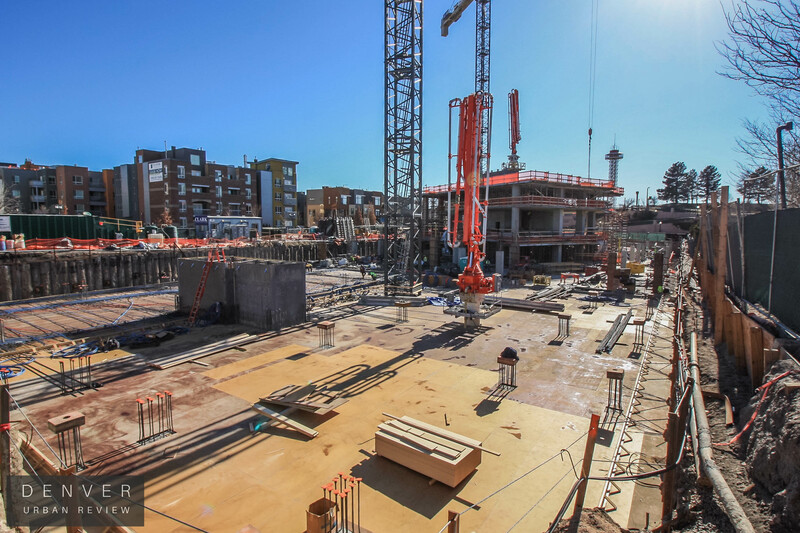 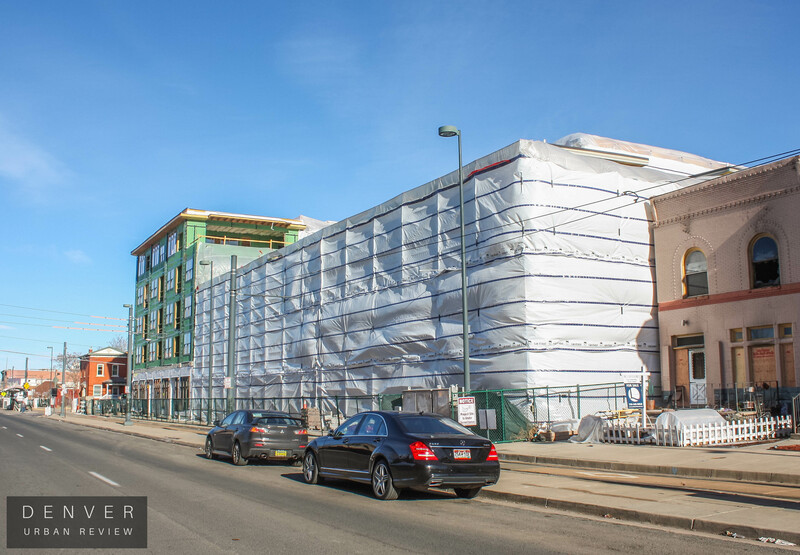 Work progresses at the construction site of the Alexan Cherry Creek project at Cook Street and 1st Avenue. 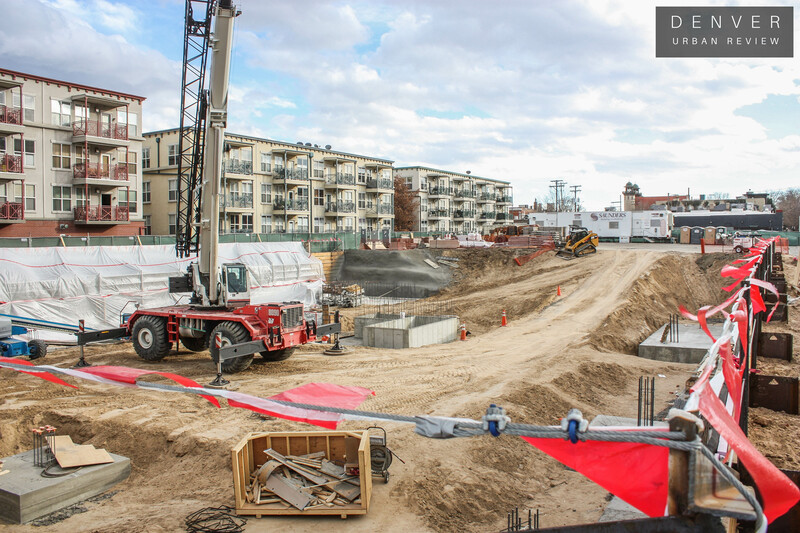 This project will rise to eight stories and will house 164 apartment units. 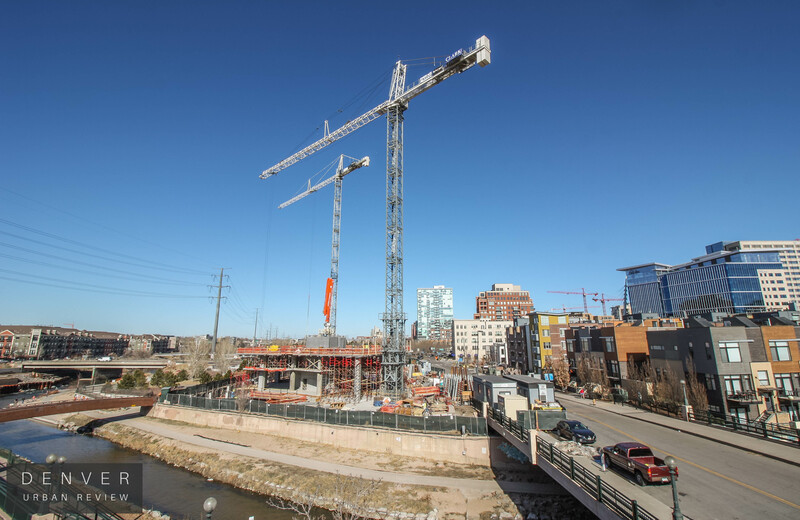 Trammell Crow is the developer of Alexan Cherry Creek. 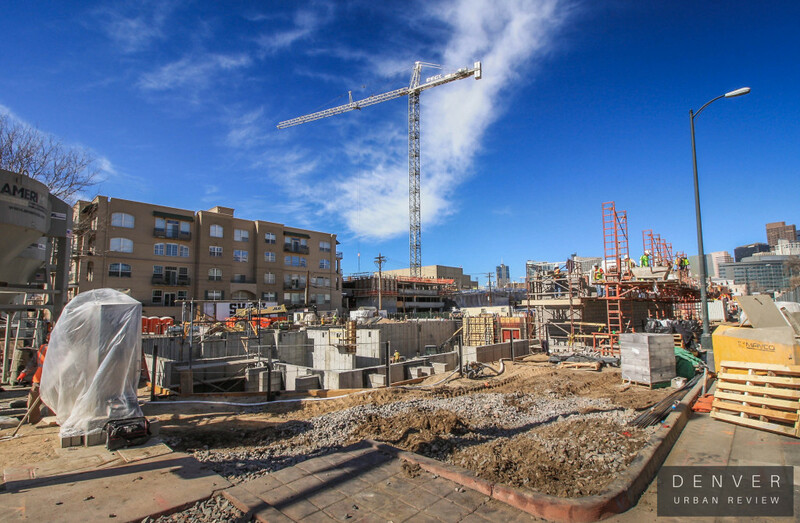 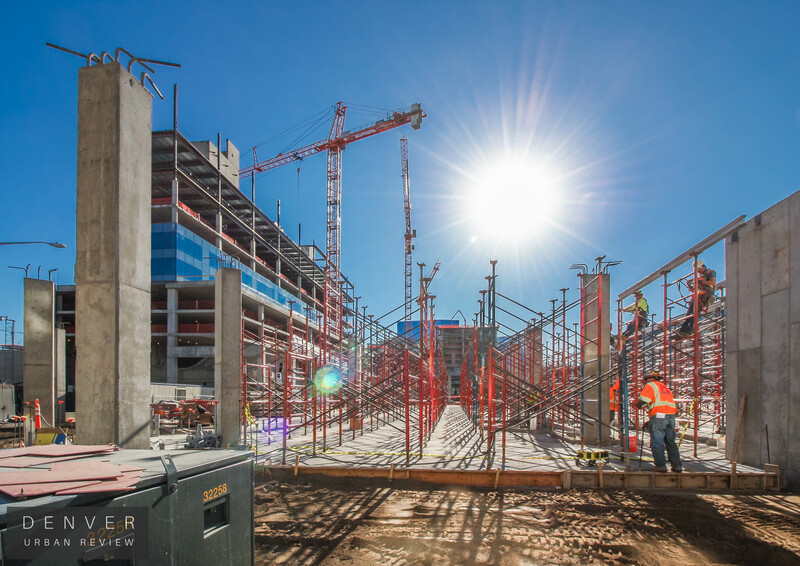 An additional Alexan project is currently under construction in the Uptown neighborhood of Denver. 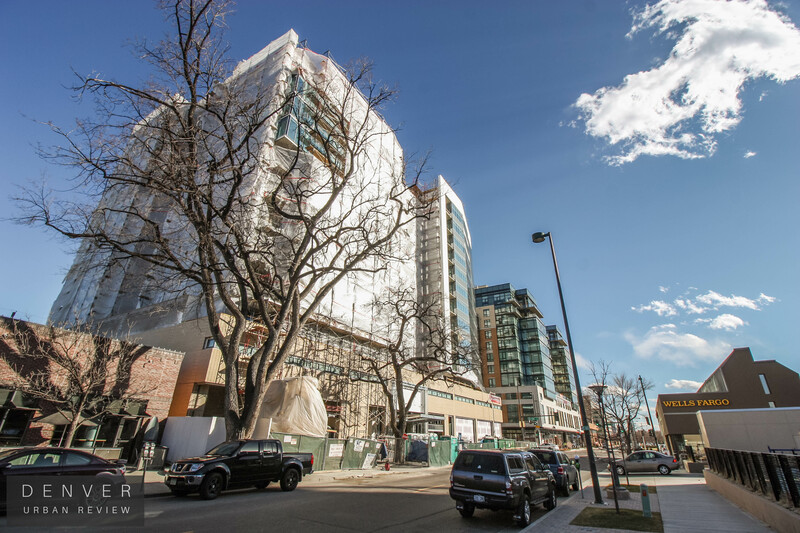 The Gables Cherry Creek apartment project at 360 South Monroe Street is now finished. 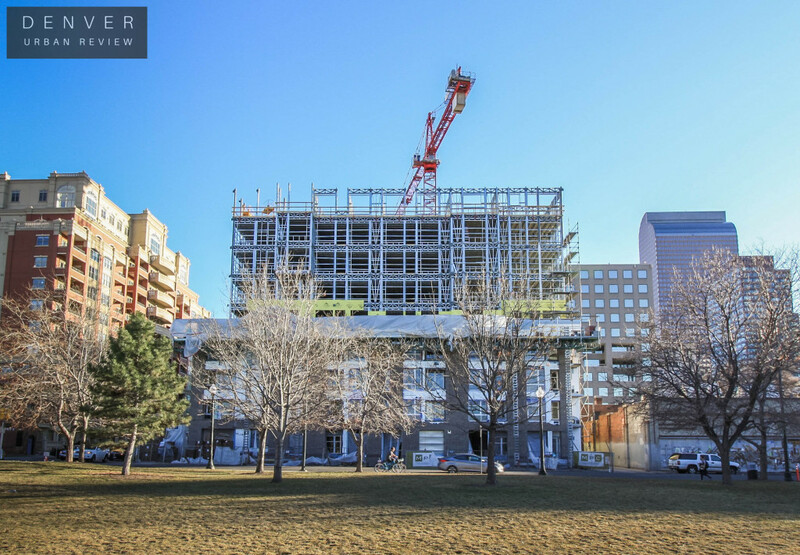 Here are a few photos of the project now that construction is completed. A 15-unit townhome project is under construction at Cedar Street and Harrison Street. 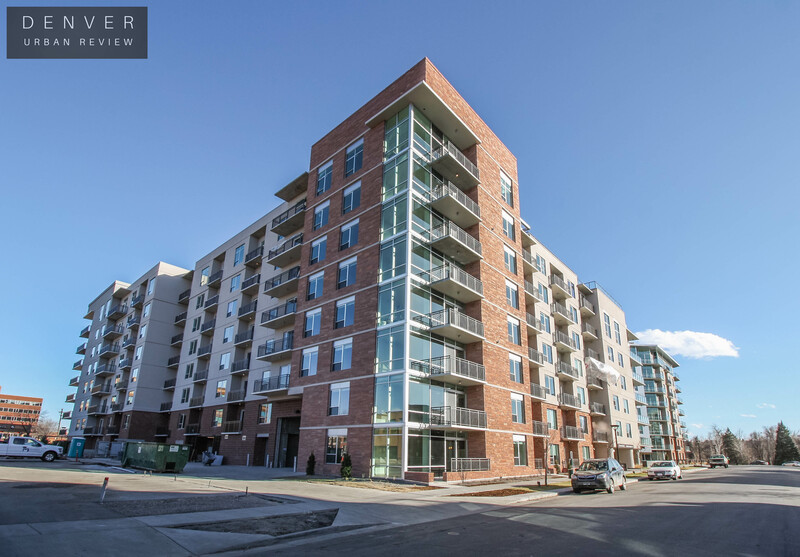 This project is titled Terrace South. Units are priced to begin in the mid $600s. That concludes this look at the construction taking place in the Cherry Creek neighborhood of Denver. 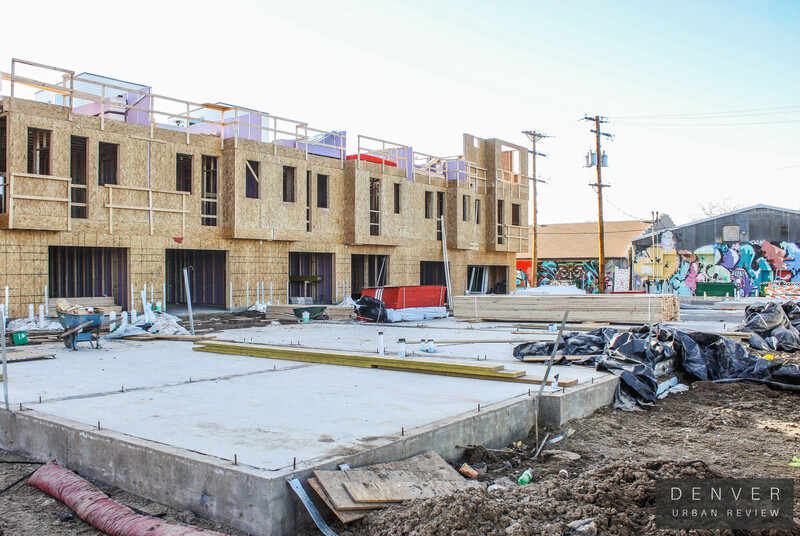 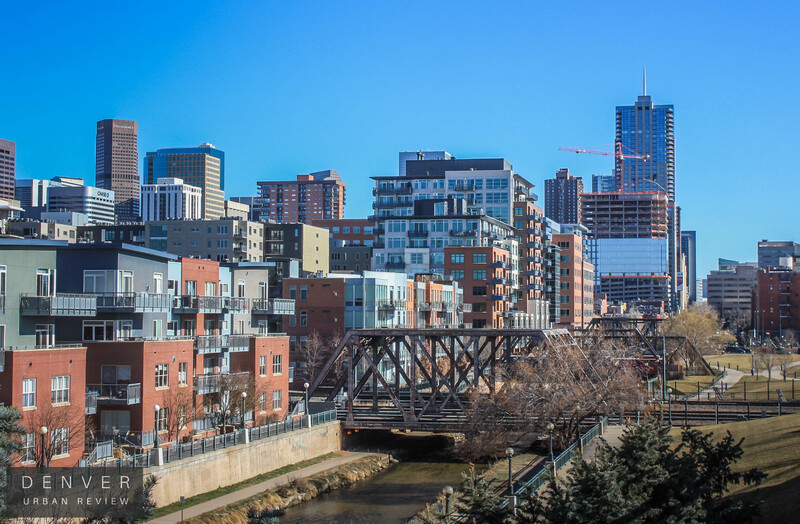 Here is a look at the progress of the projects under construction in Denver's RiNo and Five Points neighborhoods. 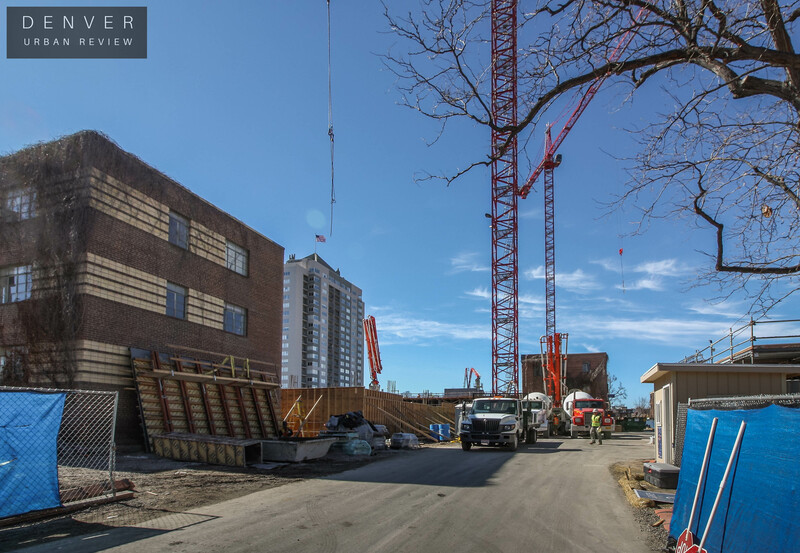 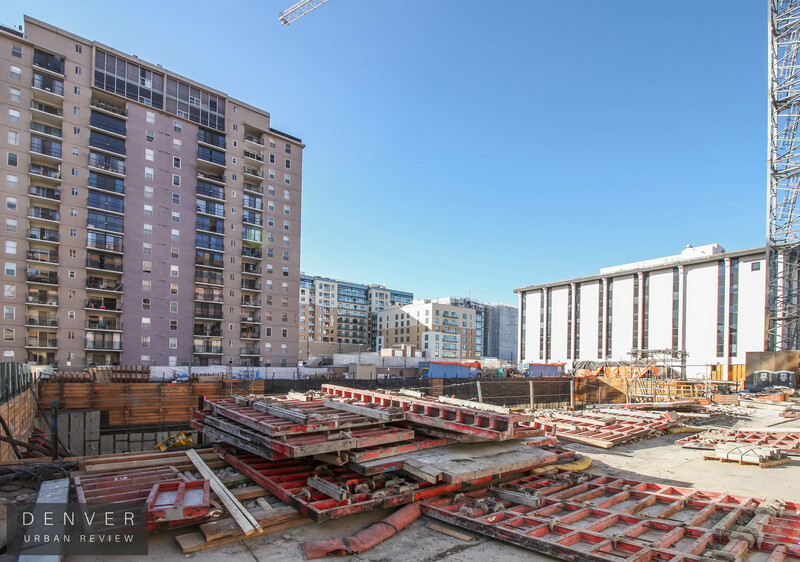 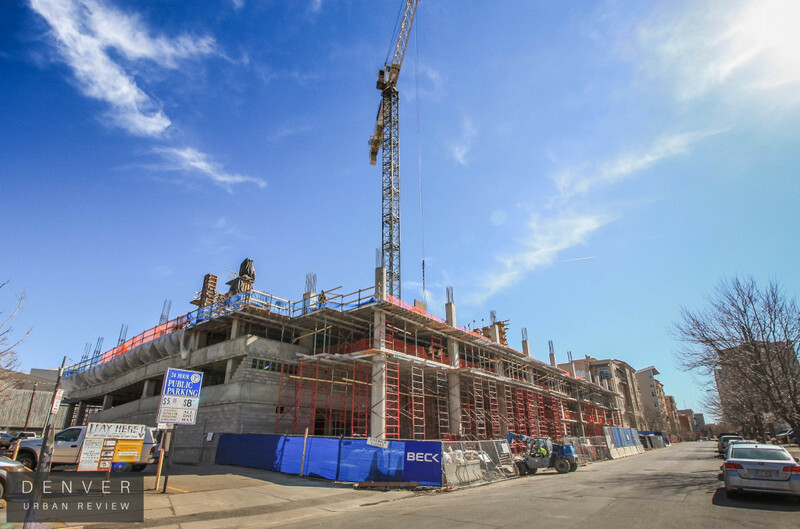 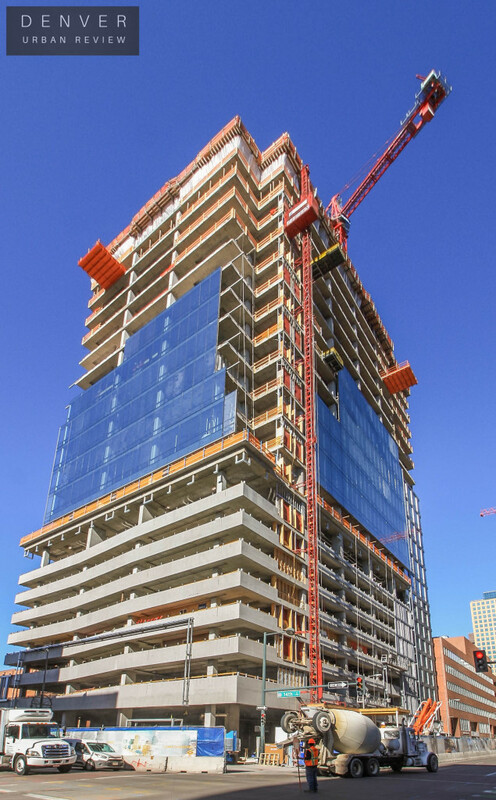 The first project seen below, is the construction site of 2300 Welton. 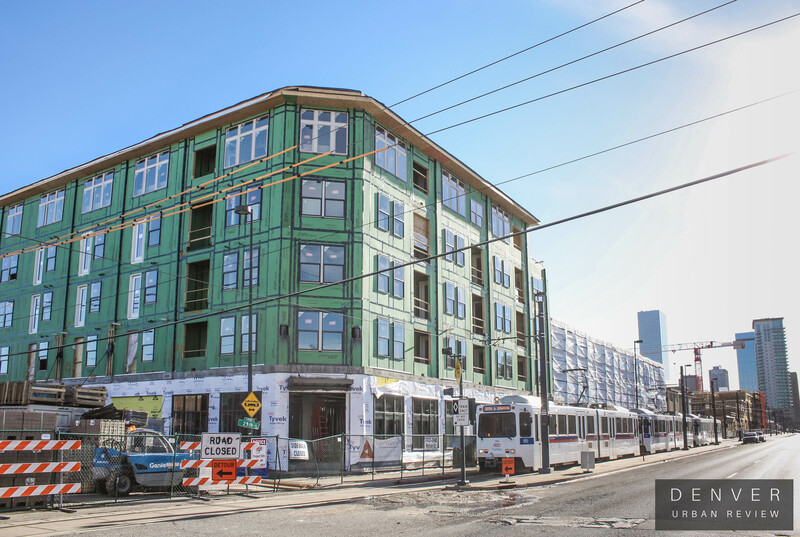 This affordable housing development will offer 223 units once completed. 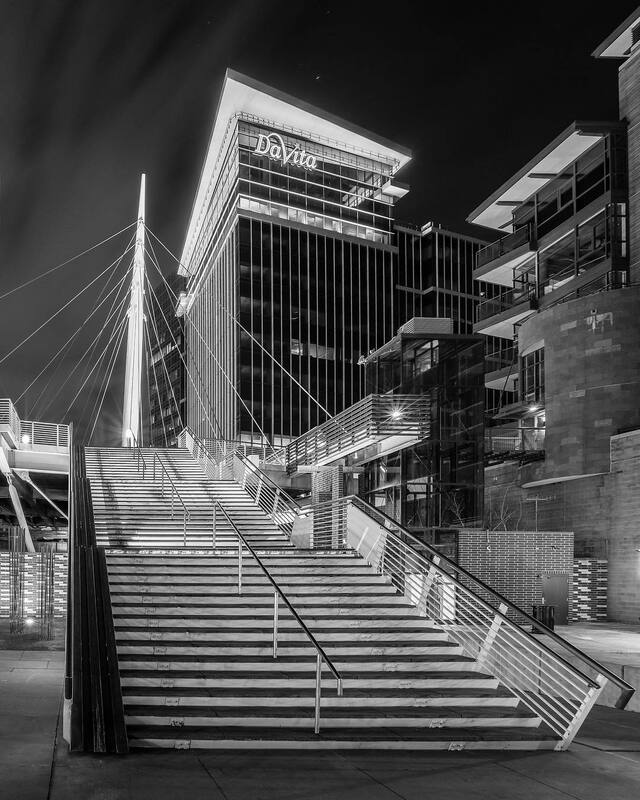 Humphries Poli Architects designed this structure. 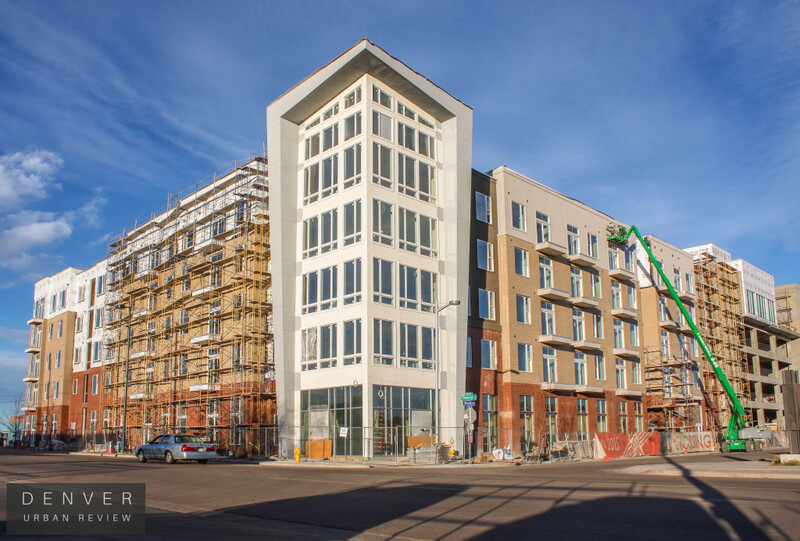 Just a short distance away at 25th and Welton and also in Denver's Five Points neighborhood is the The Wheatley project. 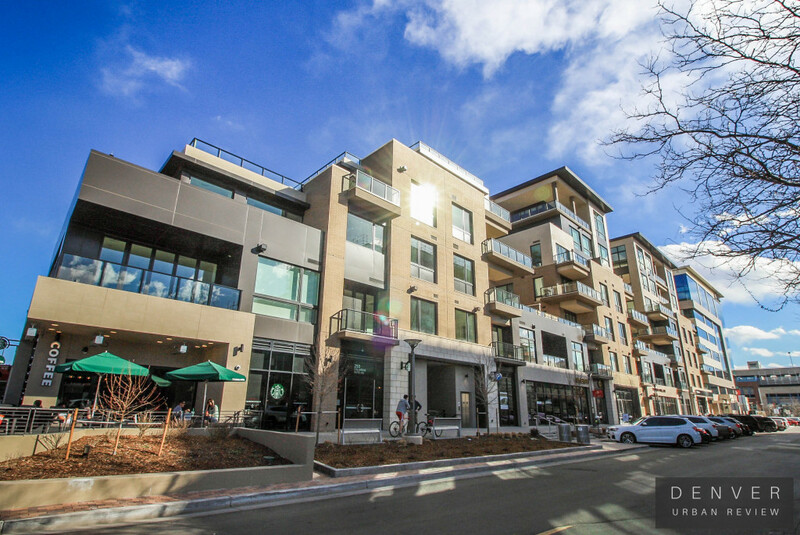 This mixed-use development was designed by Denver-based Craine Architecture. 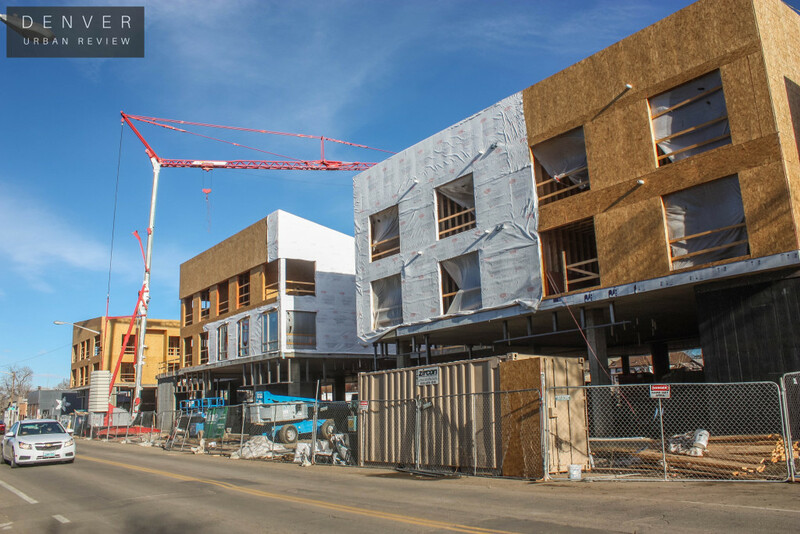 The Wheatley will include 82 apartments with 64 for of those units at market rate, 14 townhomes and 3,800 square-feet of retail space. 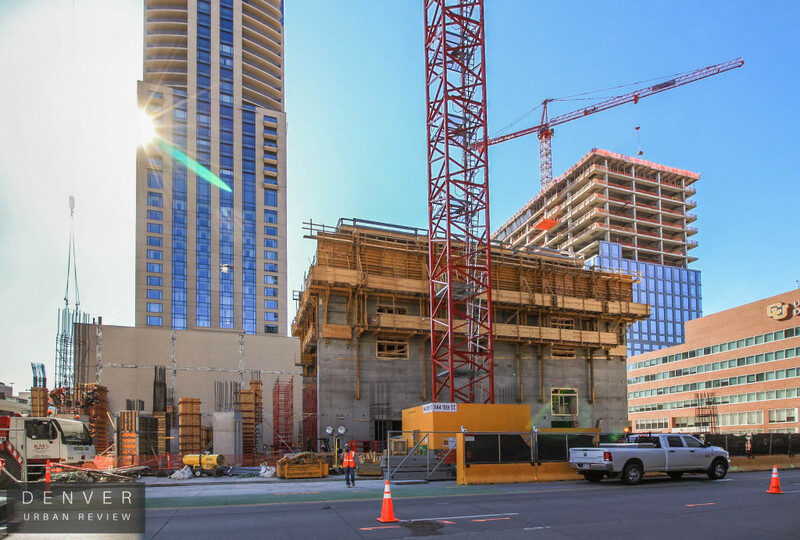 Palisade Partners is the developer. 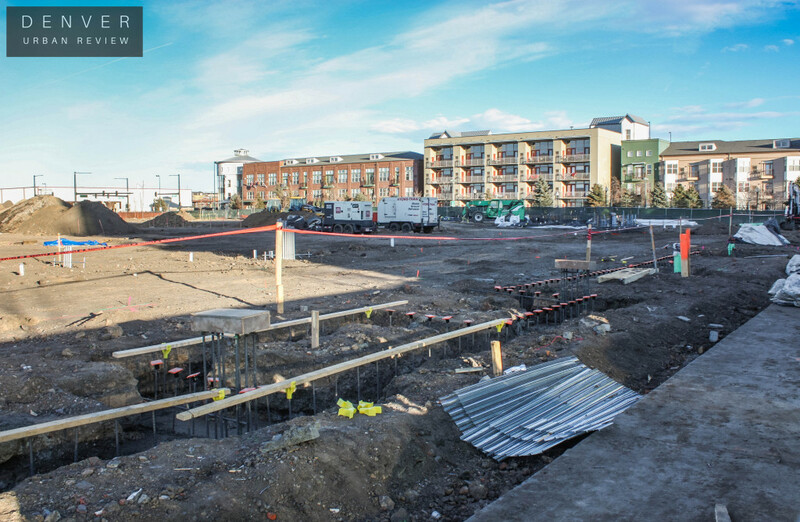 Below is a photo of Alloy on Lawrence townhome project at 32nd Street and Lawrence in RiNo. 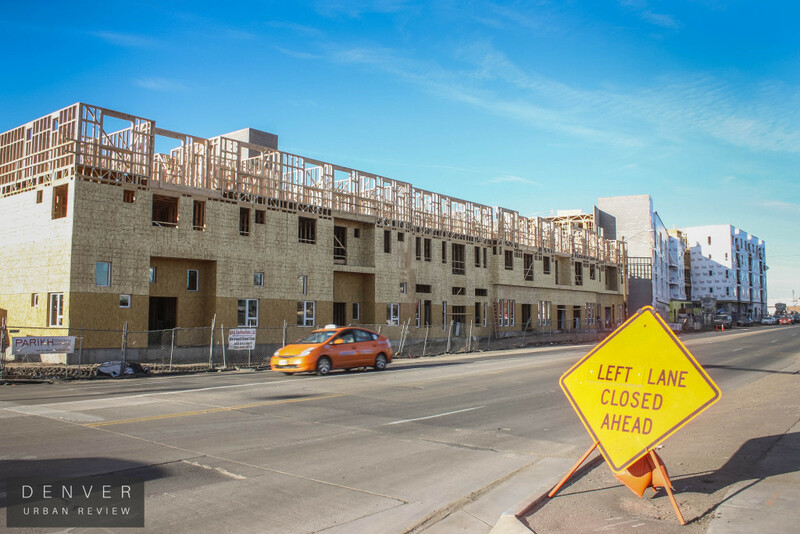 Alloy will include 7 townhomes once completed. 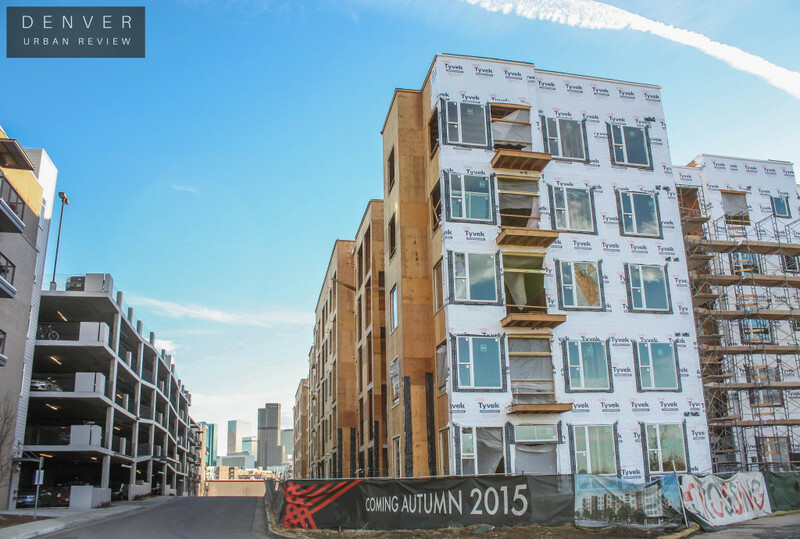 Fuse Living is developing this project. 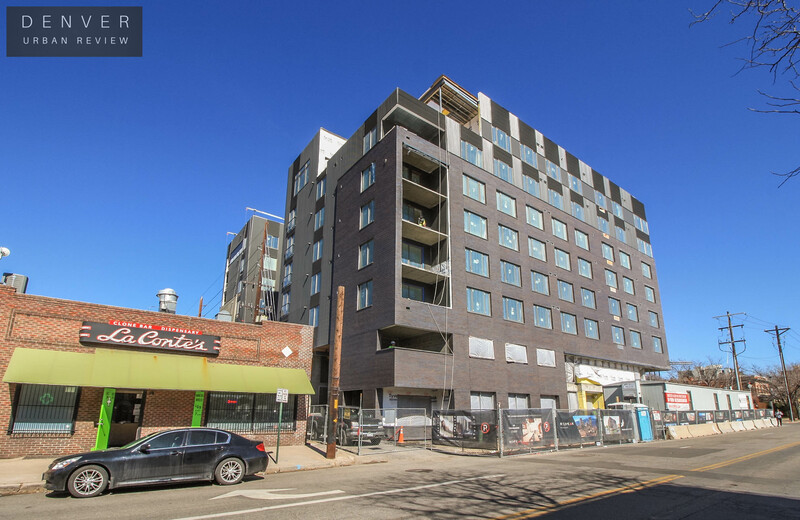 Craine Architecture is the firm that designed Alloy on Lawrence. 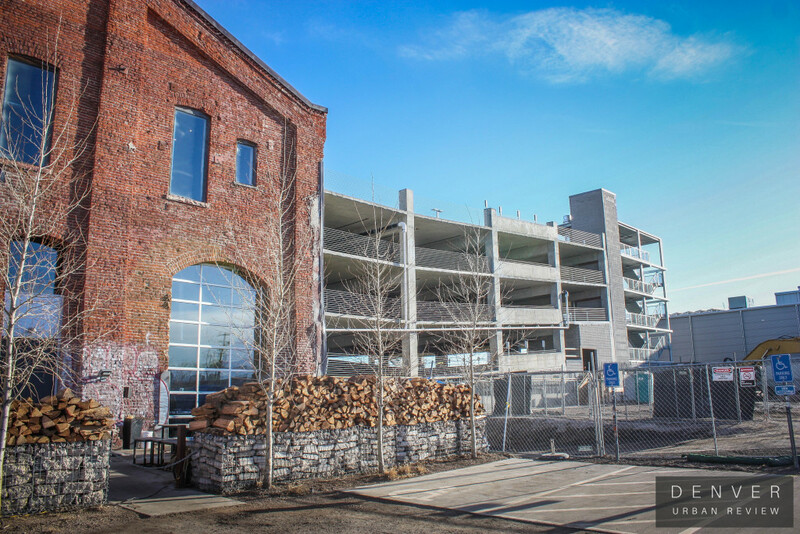 Also under construction in RiNo is the mixed-use 35th and Larimer project. 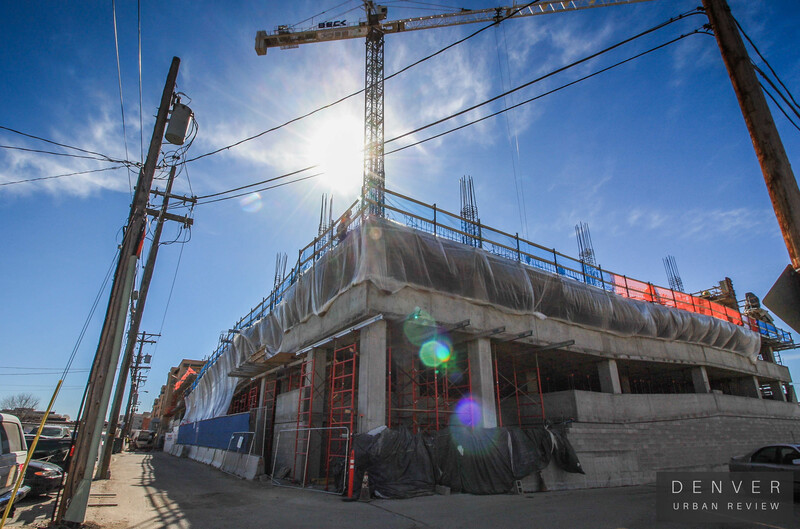 This development will feature ground-floor space for retail and office use, with two floors of apartments siting above. 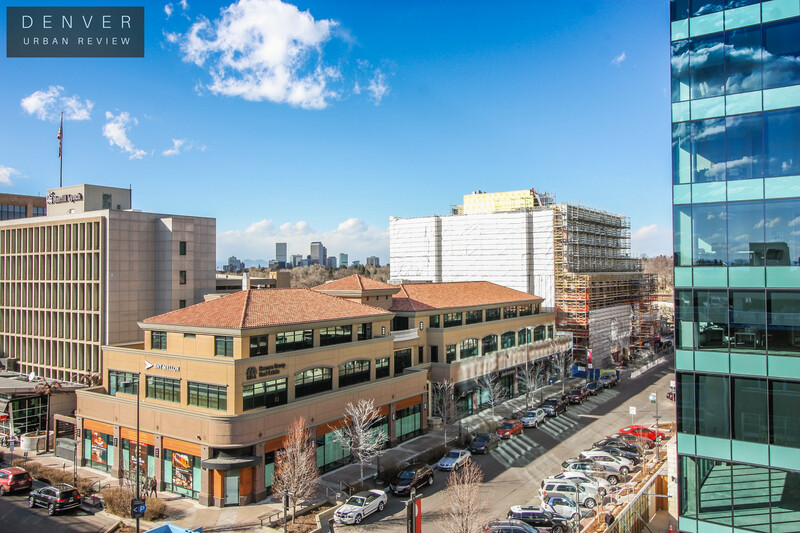 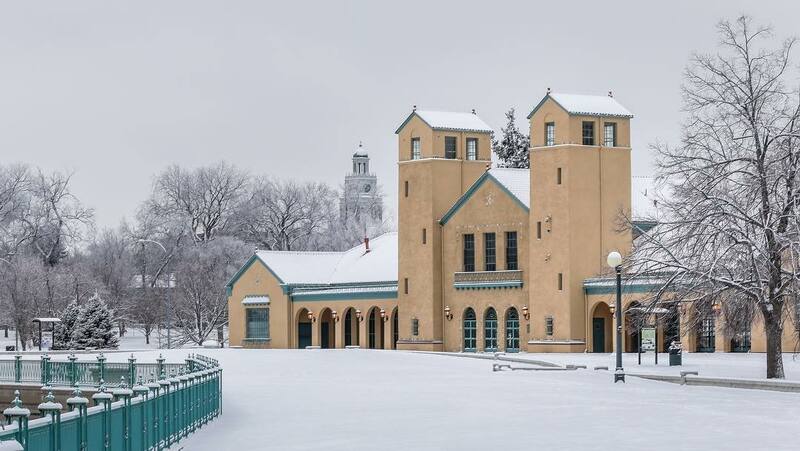 Humphries Poli Architects designed this project and Littleton Capital Partners is the developer. This project is slated to be completed in June. 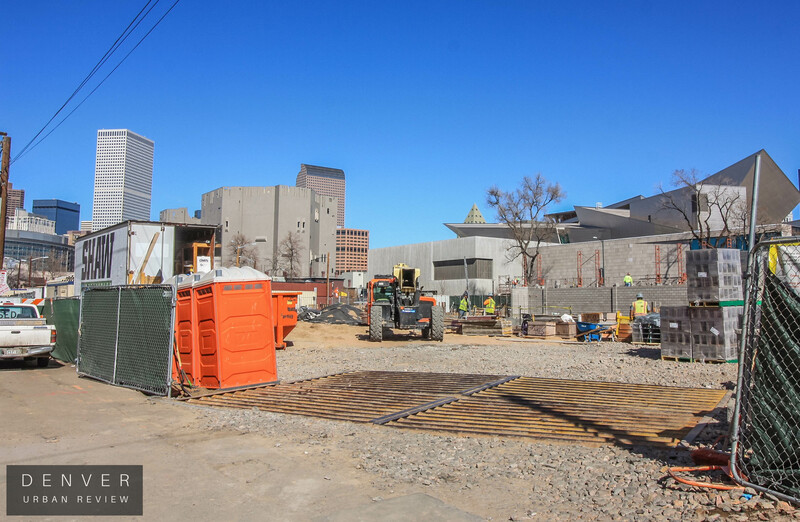 Signage attached to the construction fence indicates that the project is now titled Link 35. 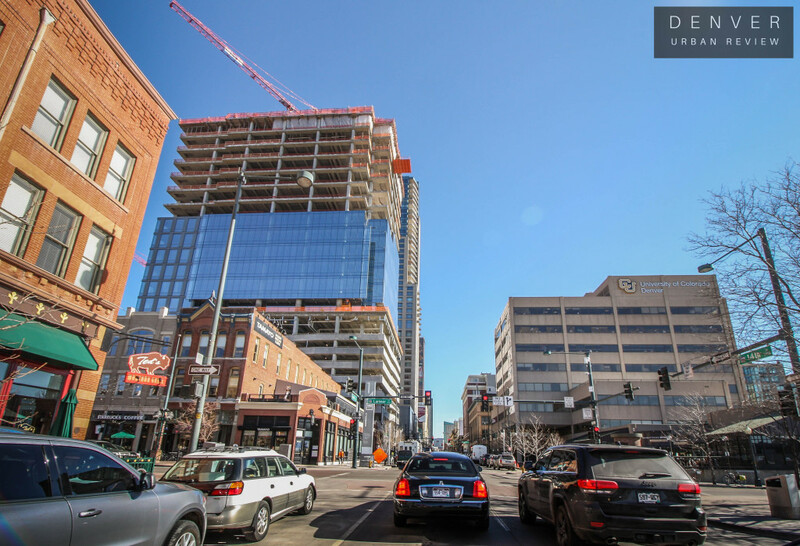 Below are a couple of photos of Link 35 from Larimer Street. 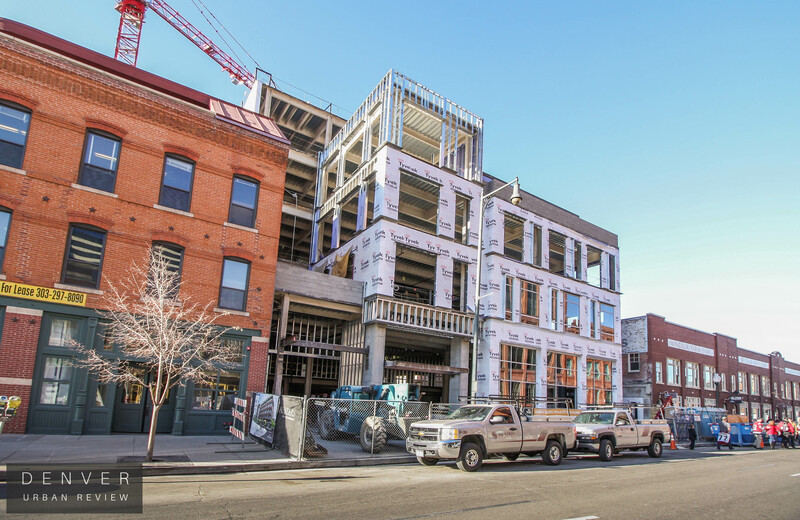 On the 3400 block of Larimer Street we find the construction site of the Larimer Row project. 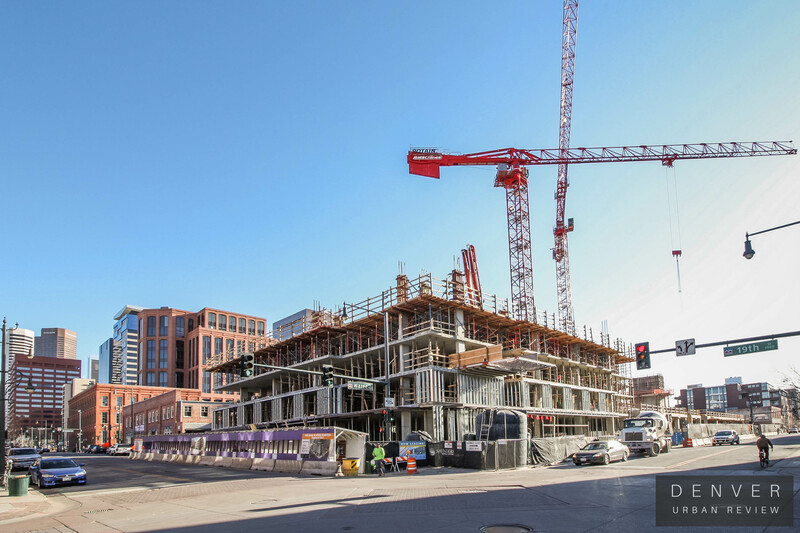 Residents have now moved into the units in the first phase of this project; phase 2 of Larimer row is now under construction. 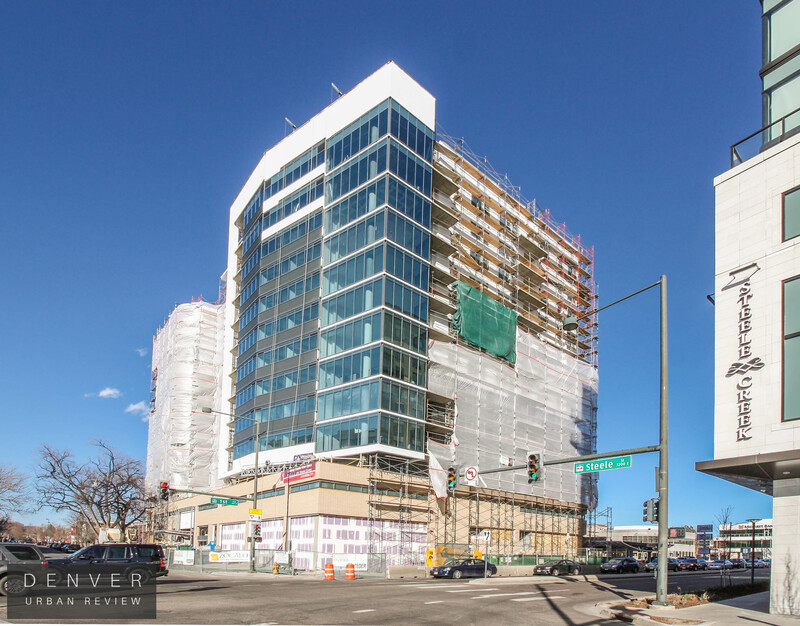 This project was designed by EVstudio and is being built by BLVD builders—both of which are Denver based. 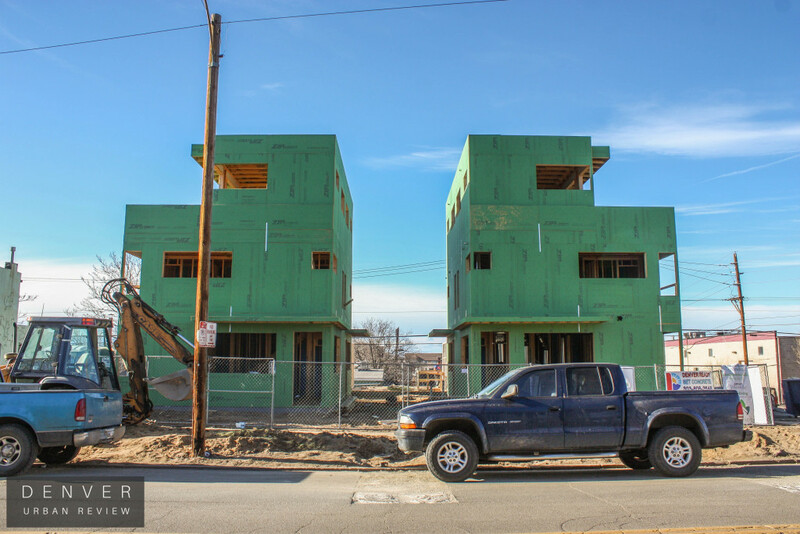 Over at 32nd Street and Blake is the Factory Flats development that will feature 24 for-sale condo units. 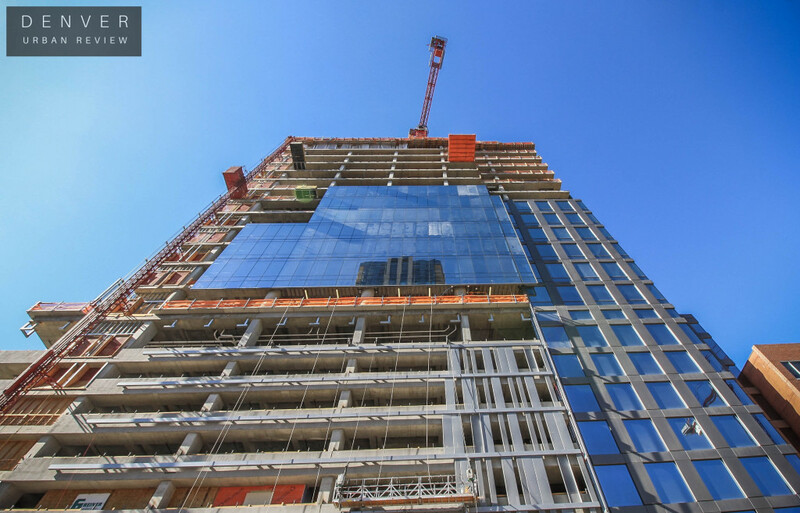 The units will be powered by solar panels and will range in size between 1,188 to 1,456 square feet. 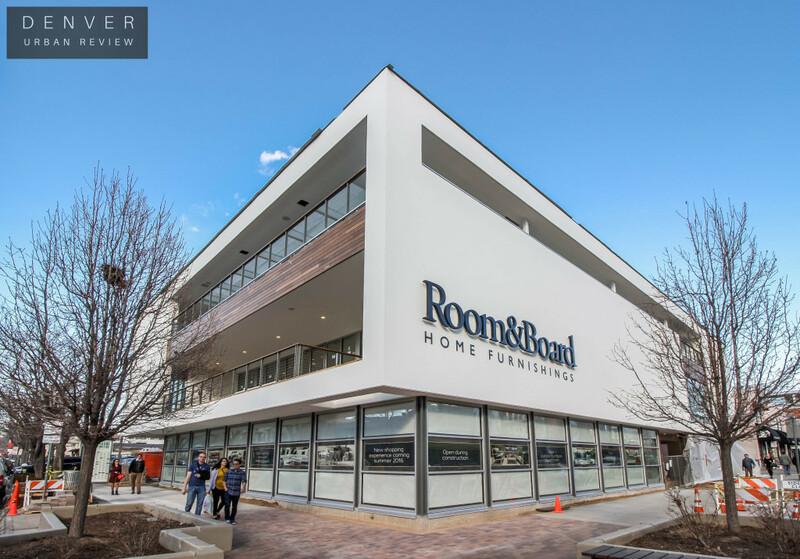 Ground floor space for retail or office use has been incorporated into this development. 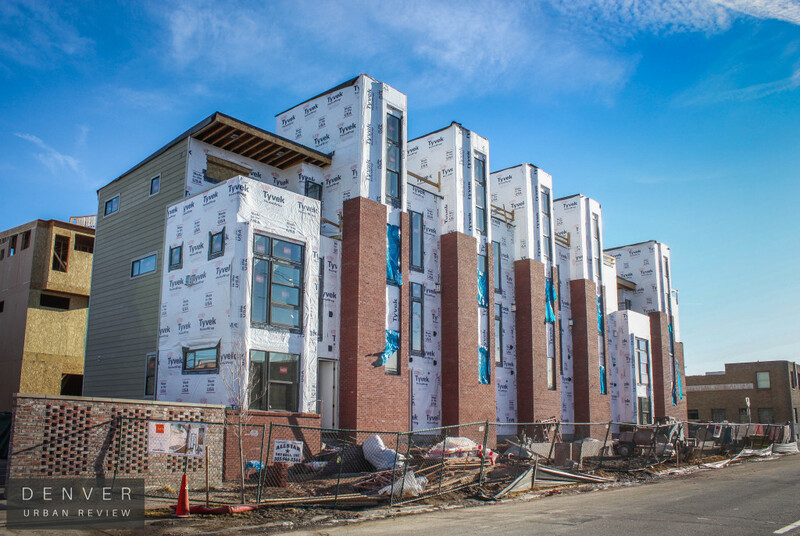 At 30th and Blake Street is the Backyard on Blake mixed-use development that includes office, retail, and residential components. 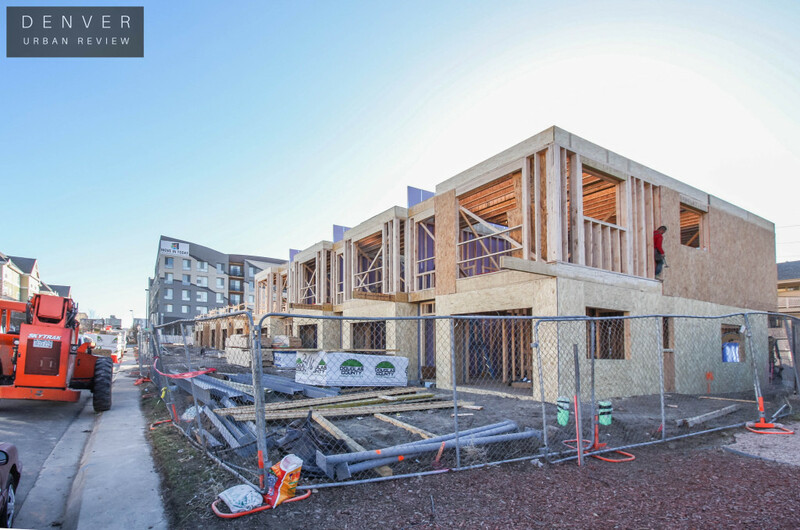 The below photo points towards the residential portion of Backyard on Blake that will include 14 townhomes. 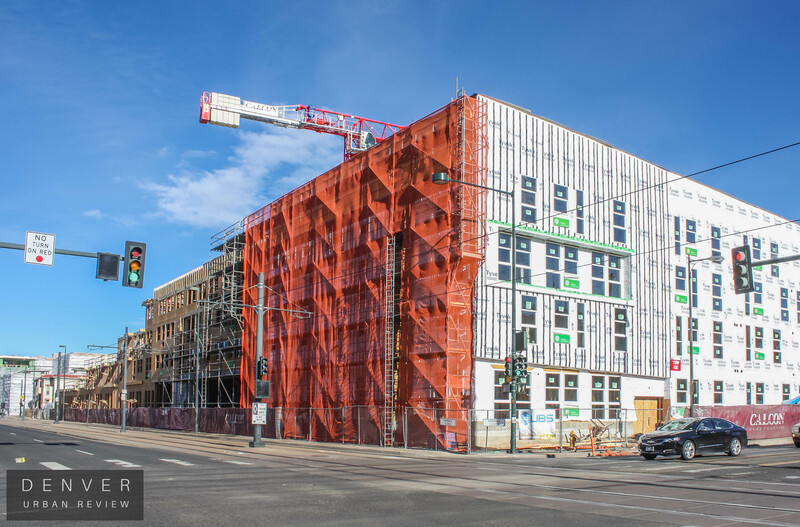 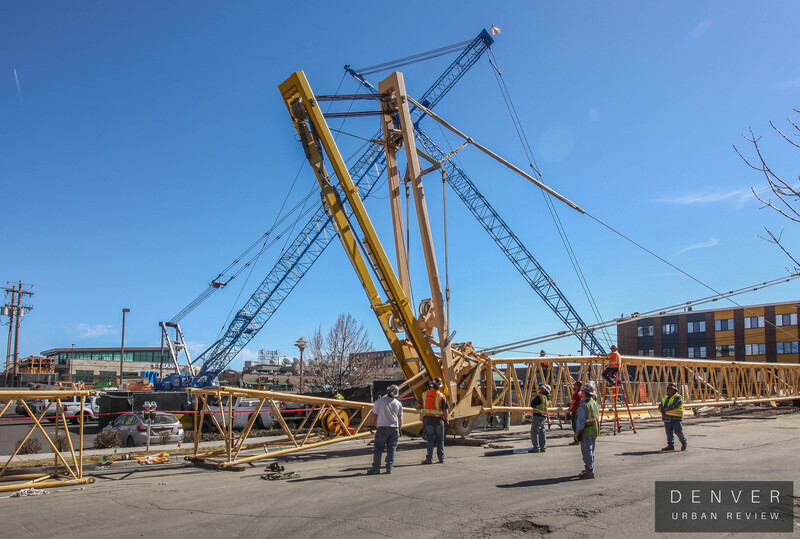 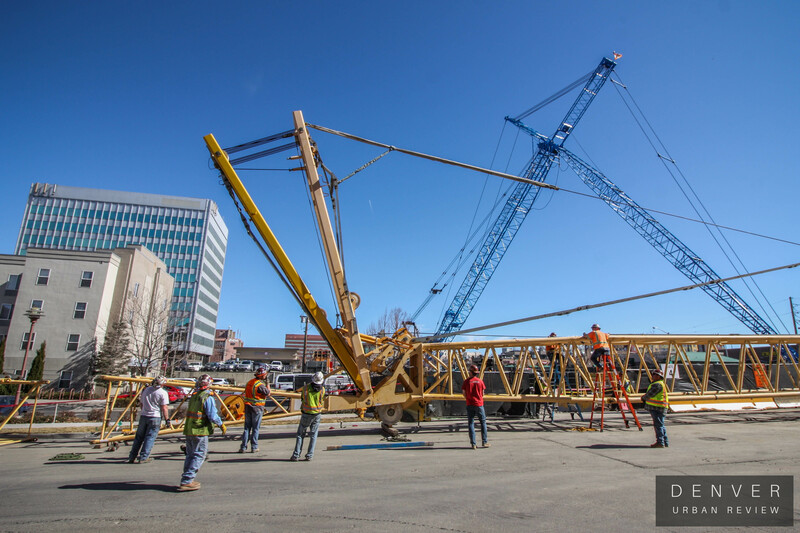 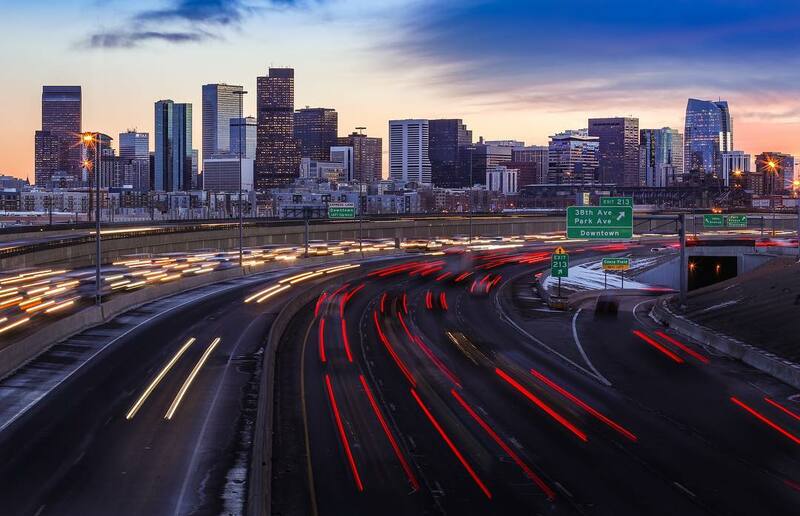 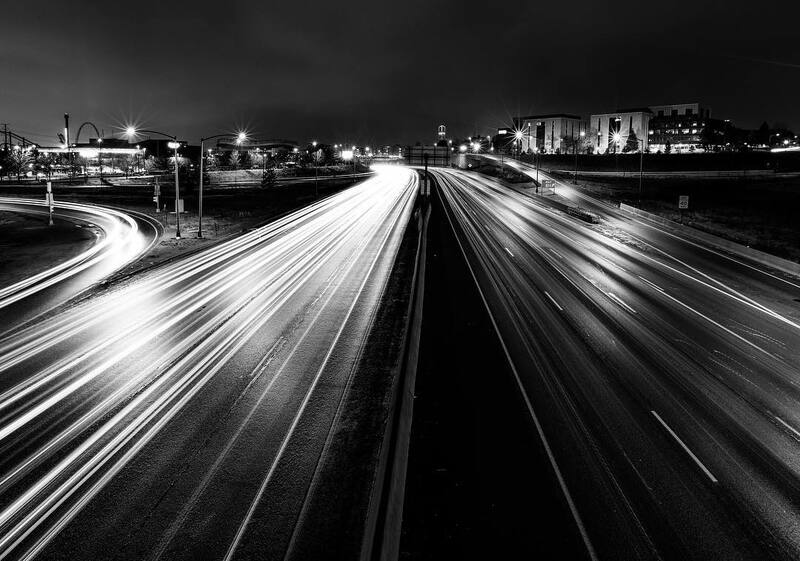 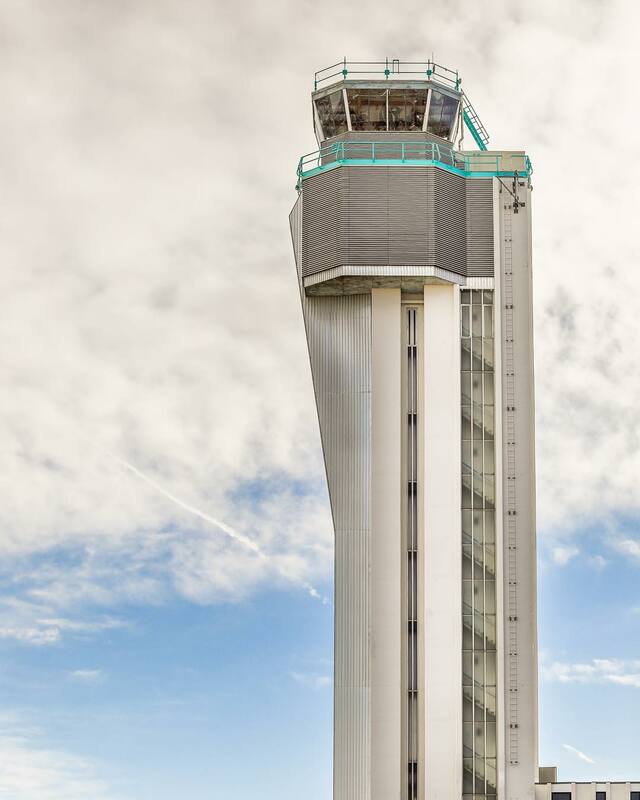 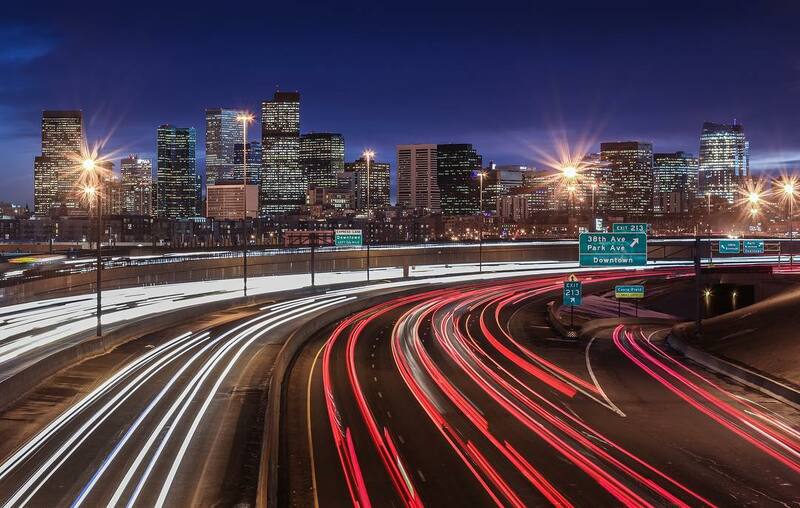 Colorado-based Invent Development Partners is the developer and Denver-based Sprocket Design-Build is the architect and general contractor of this construction project. At 31st and Brighton Boulevard progress can be seen on the mixed-use development that is under construction. 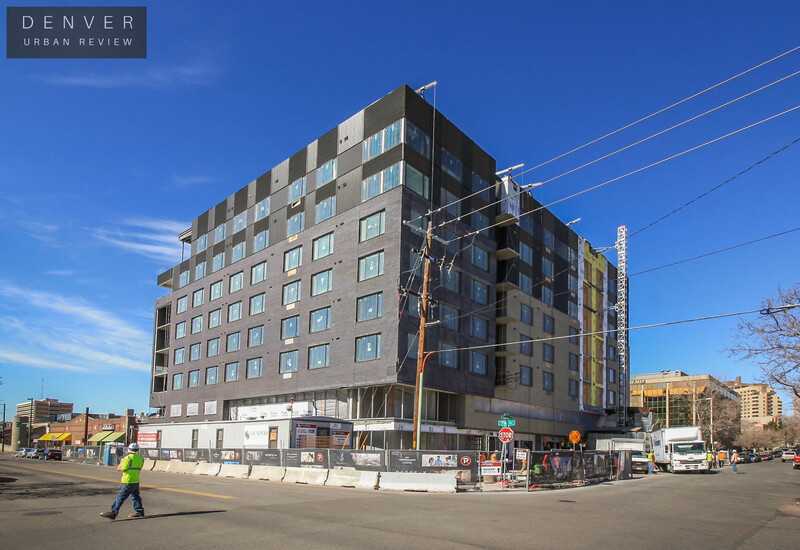 Here are couple photos of the project from Brighton Boulevard. 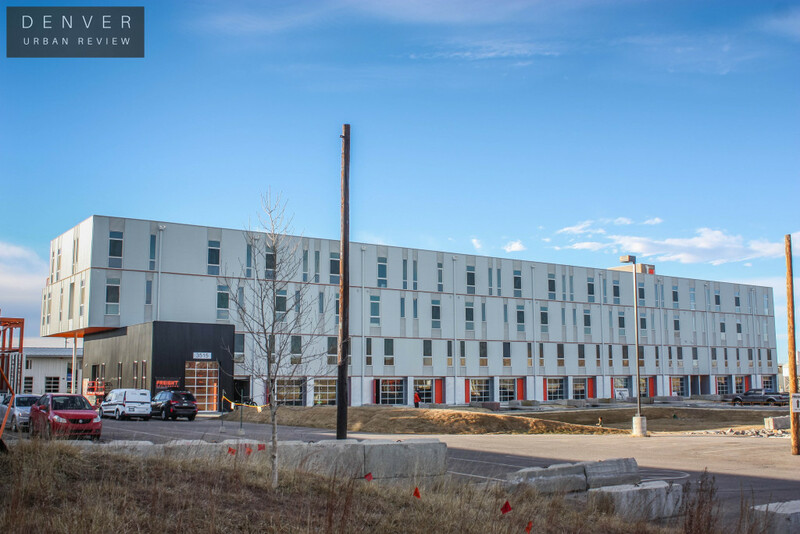 Just a short distance away and also located on Brighton Boulevard is The Source Hotel. Dynia Architects designed the hotel and. 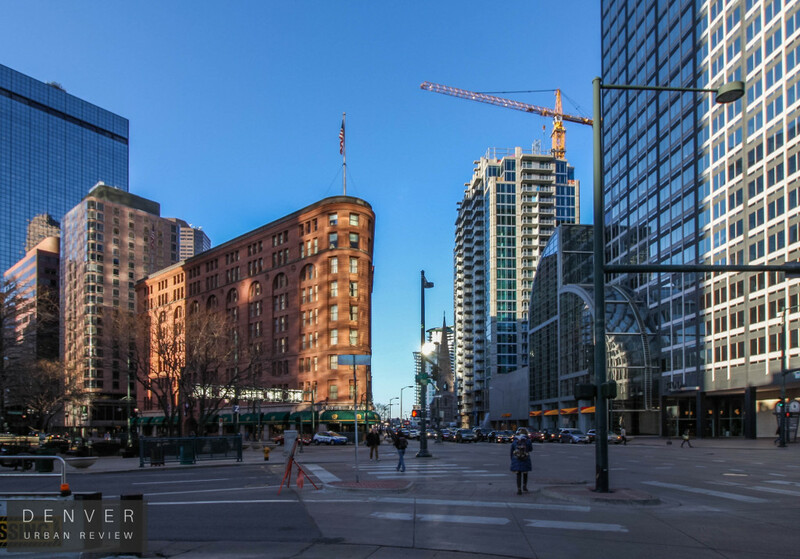 Zeppelin Development is the developer. The hotel is taking shape adjacent to The Source marketplace. 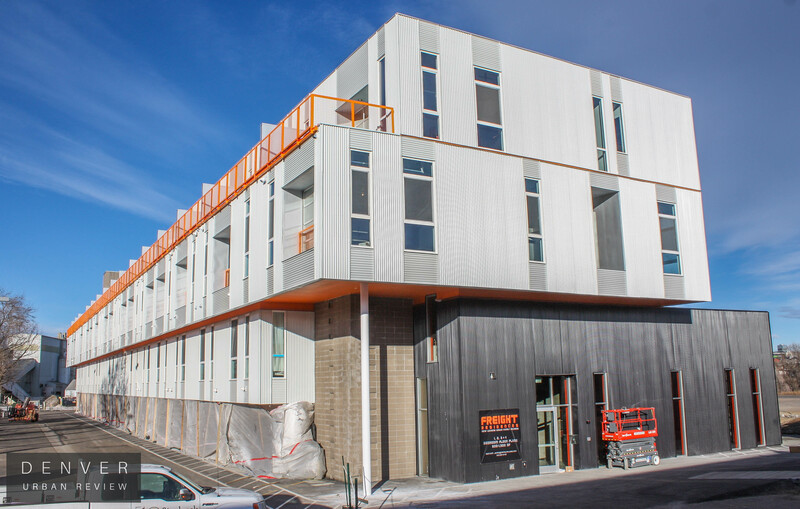 The Freight Residences at the TAXI campus are just about complete. 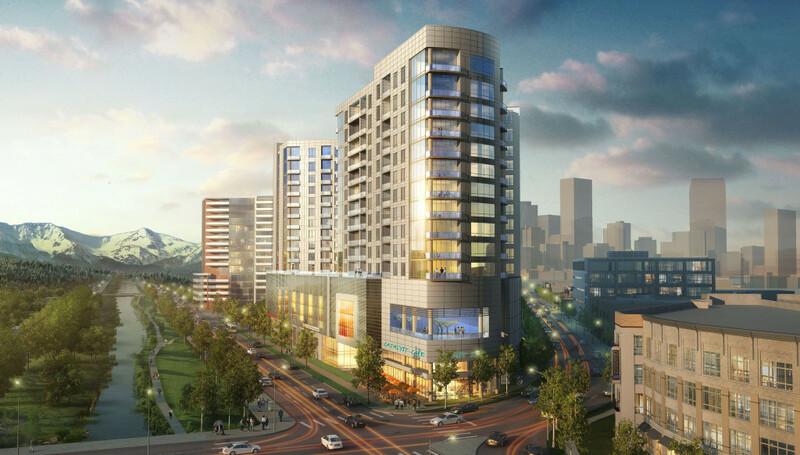 This project was also designed by Dynia Architects and is being developed by Zeppelin Development. 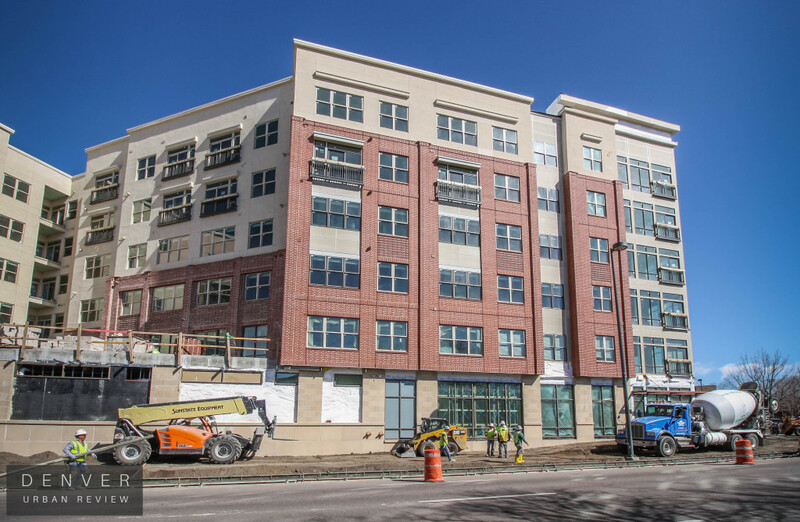 At 2980 Brighton Boulevard is the site of a 362-unit apartment project. 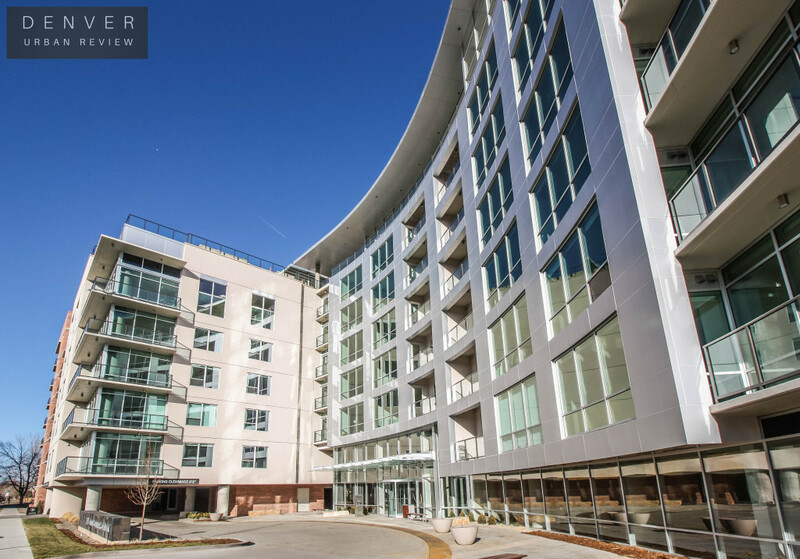 Mill Creek is the developer and The Mulhern Group is the architecture firm that designed this development. 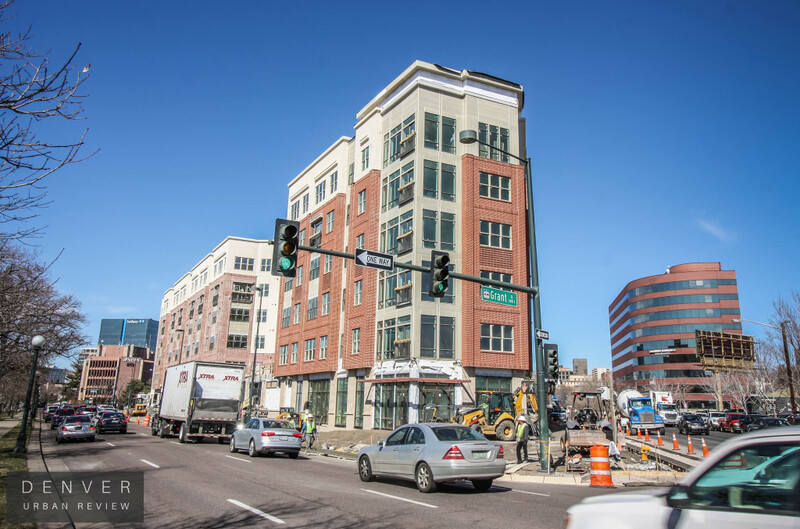 The final project we will look at is the Crossing at Denargo Market– a five-story project that will house 321 apartment units. 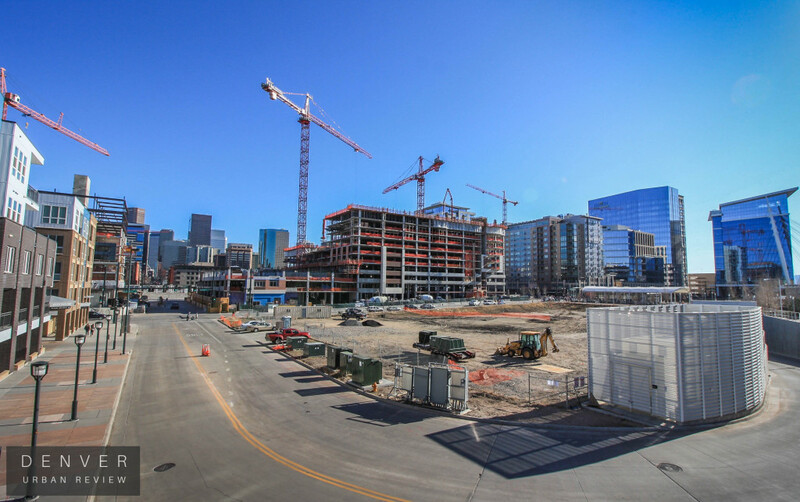 This development is located on the edge of RiNo and Denver's Ballpark neighborhood. 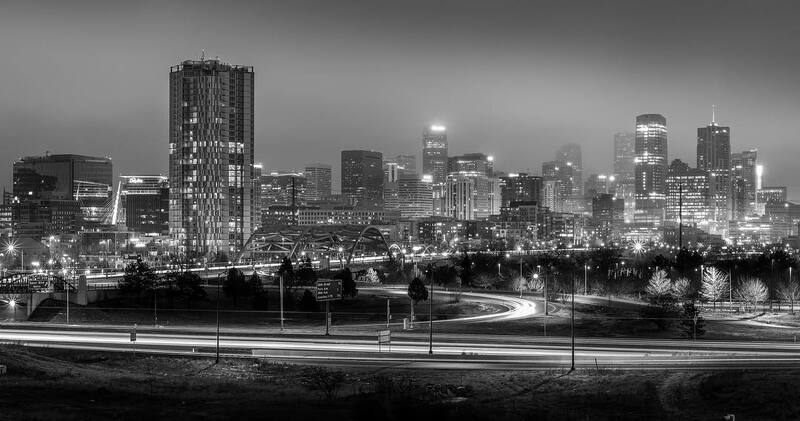 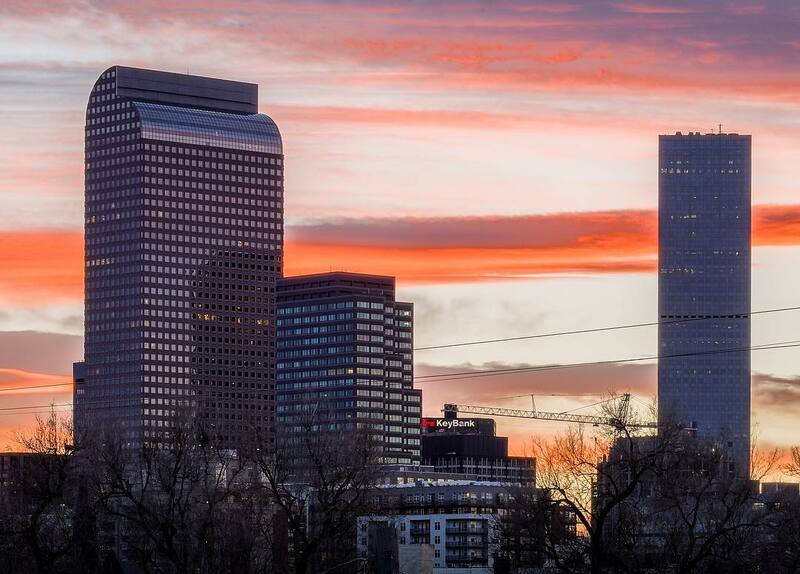 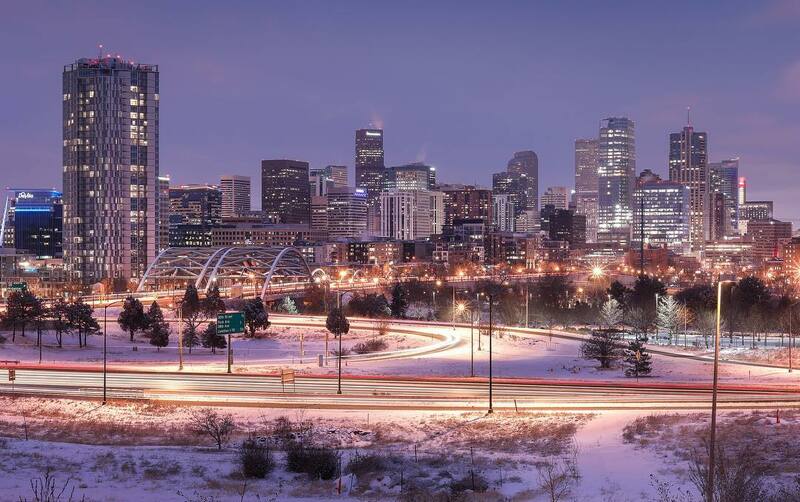 On a side note, here is photograph of the Denver skyline that I took on Saturday evening from Barnum Park.